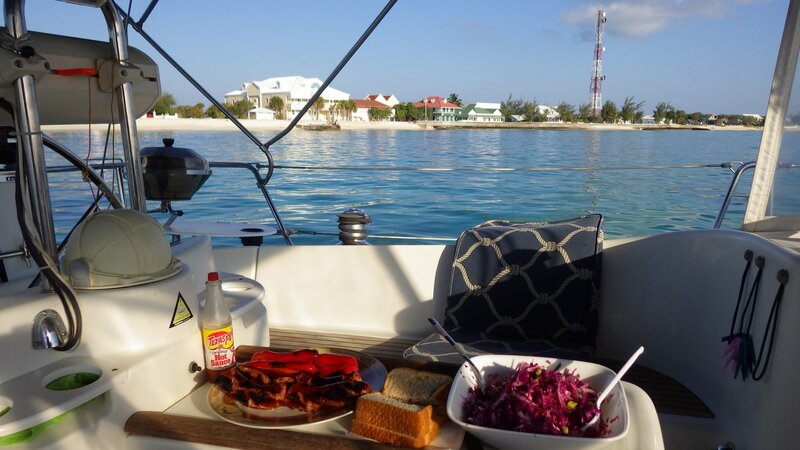 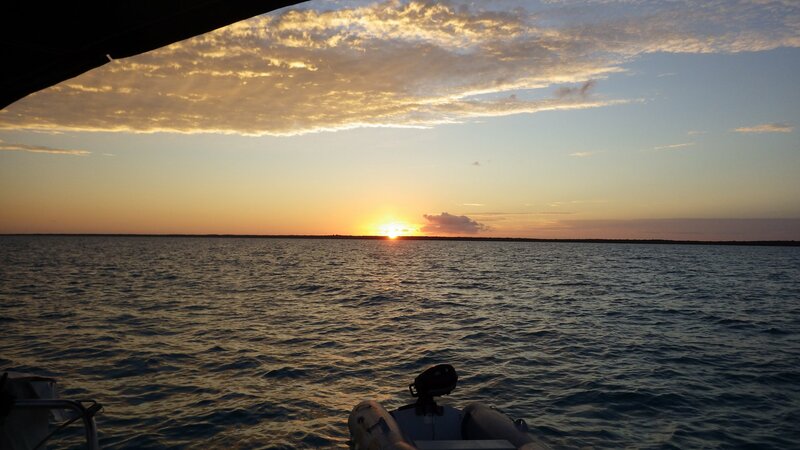 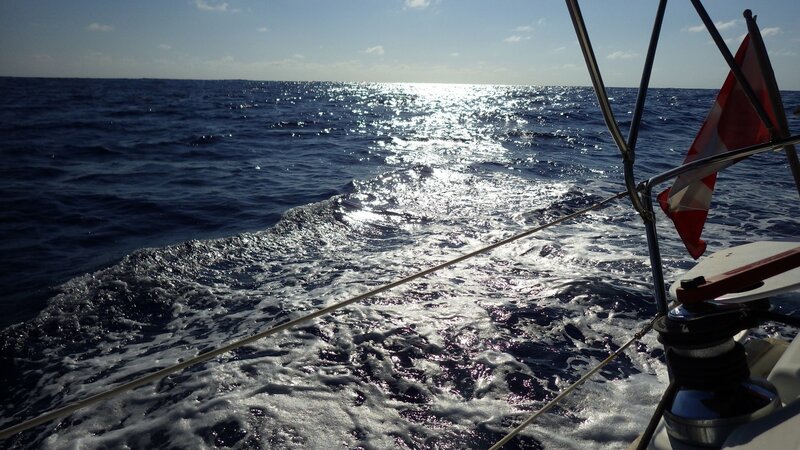 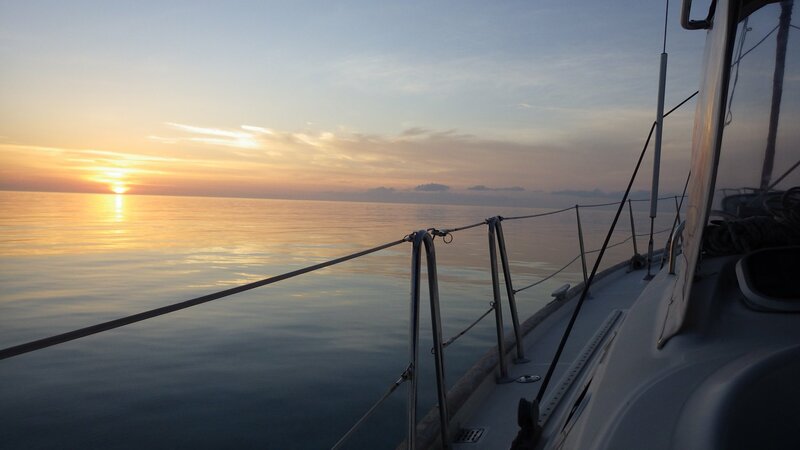 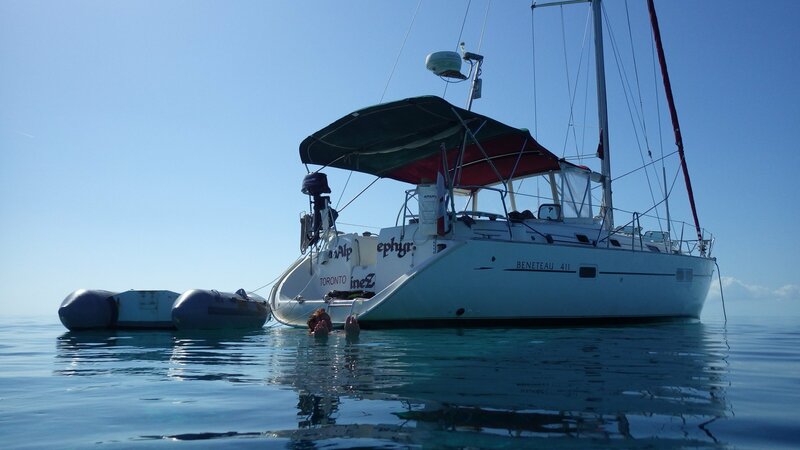 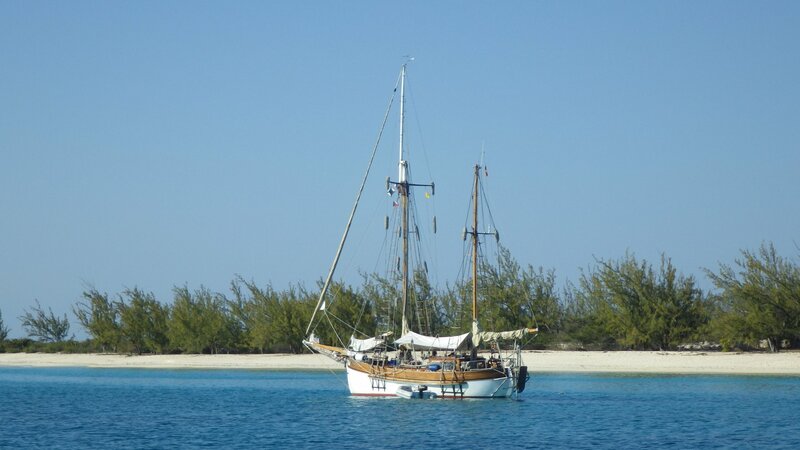 After an overnight staging of our passage at South East end of Mayaguana island, we left Bahamas for Turks and Caicos Islands, across the Caicos Passage. 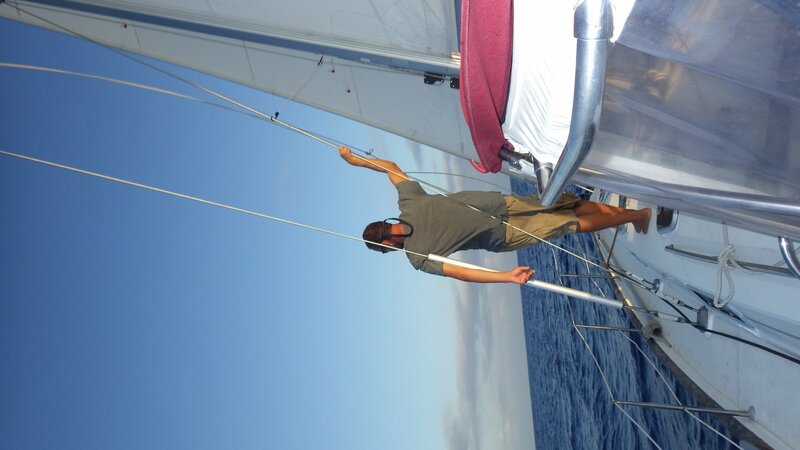 The wind was brisk at times and on the nose, so we had to do some tacking. 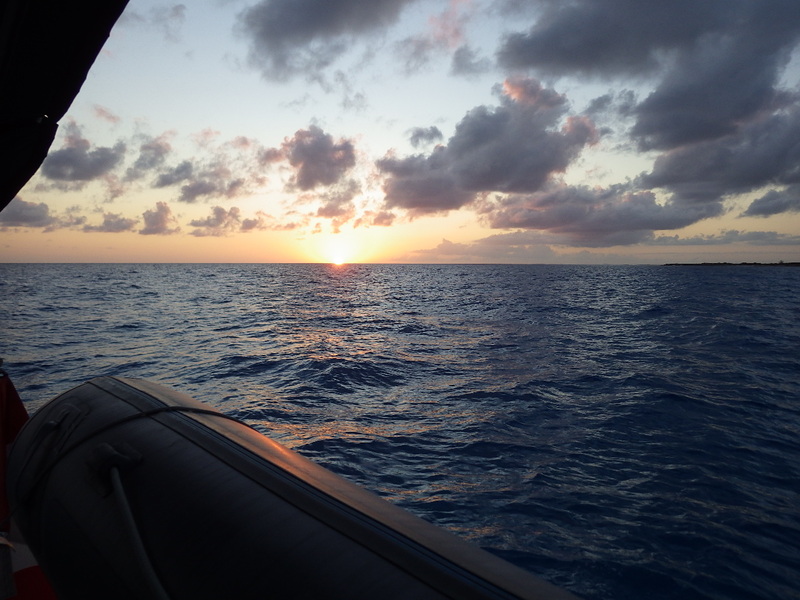 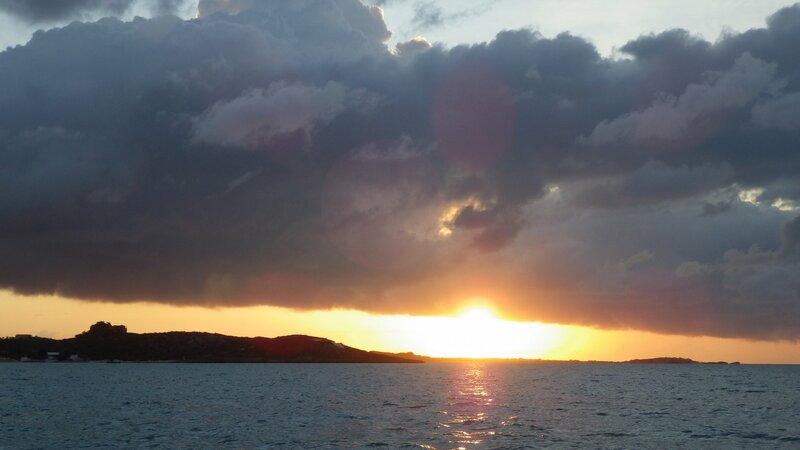 We arrived at Providenciales island after dark, anchoring overnight at the Malcolm Roadstead Anchorage, right across the high-end Amanyara Resort. 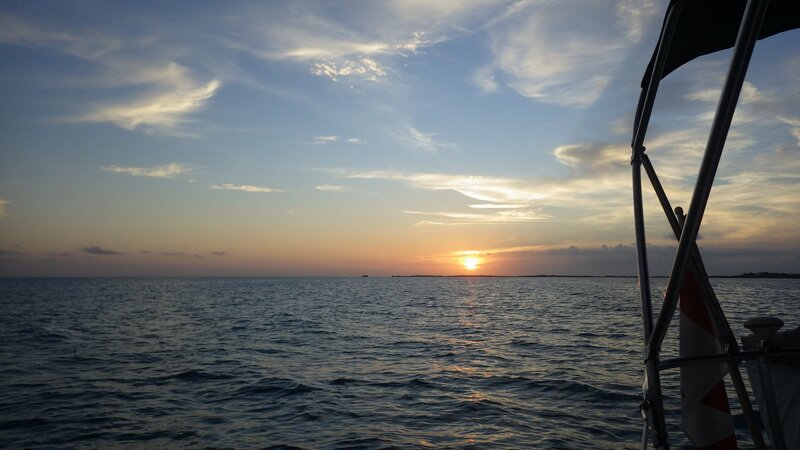 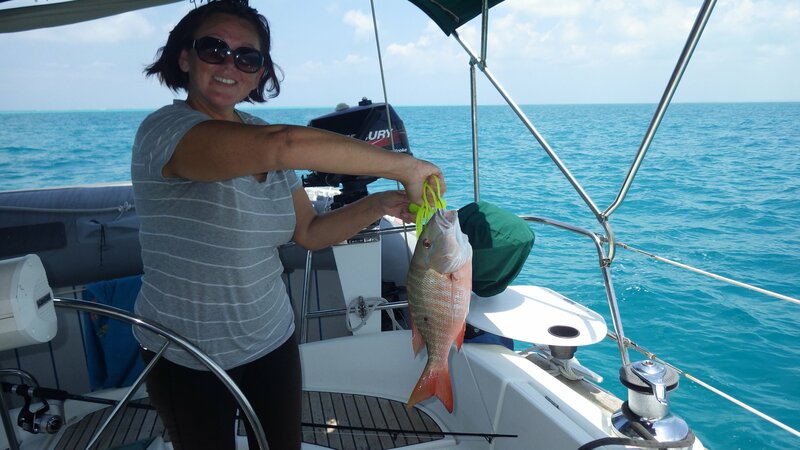 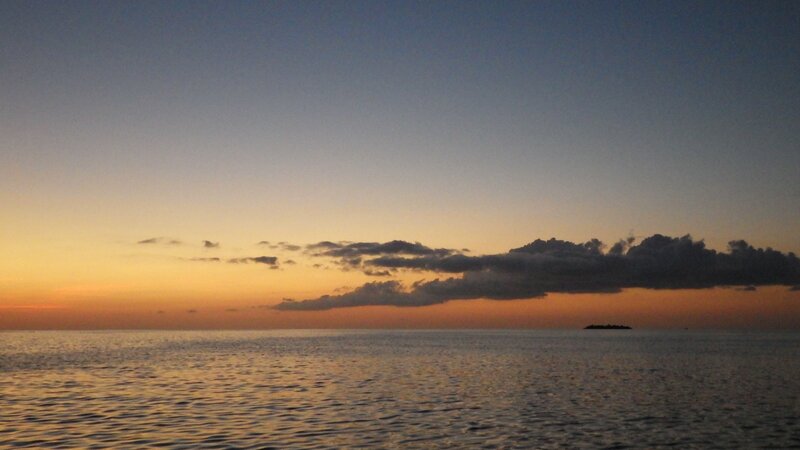 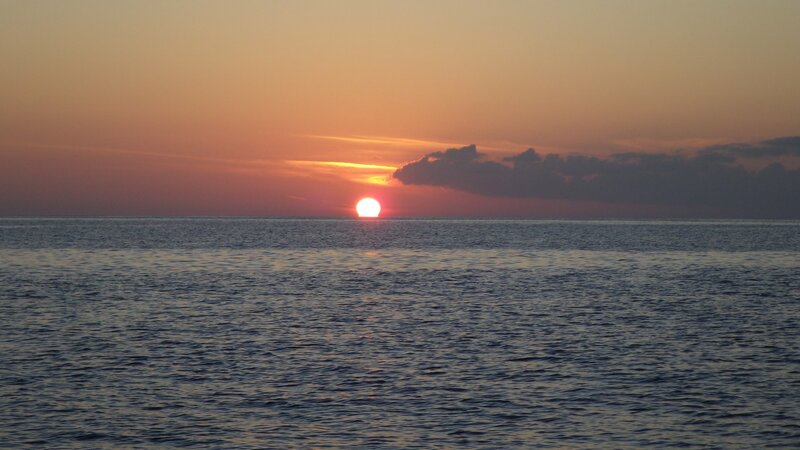 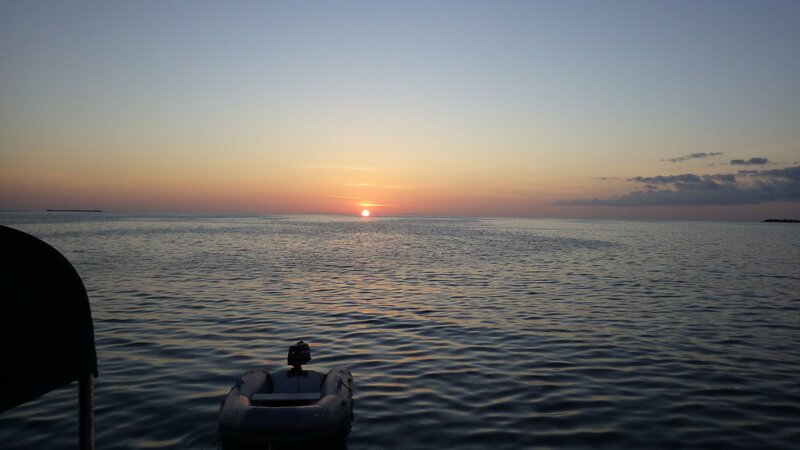 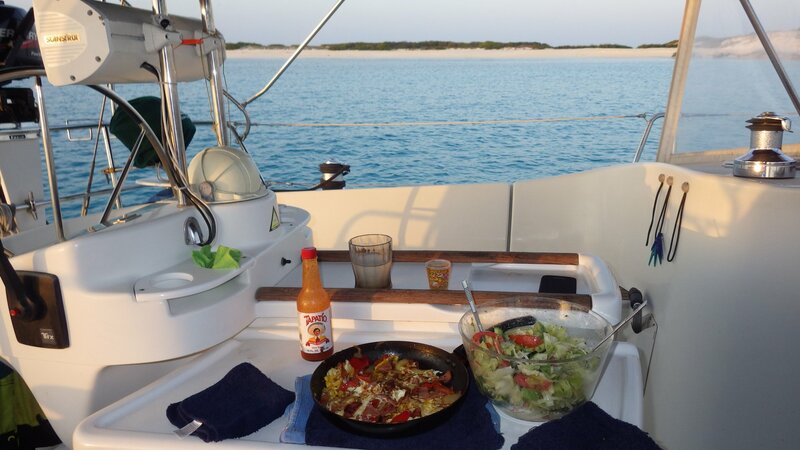 On the way to Sapodilla Bay, we have caught a nice red snapper while sailing through the Sandbore Channel. 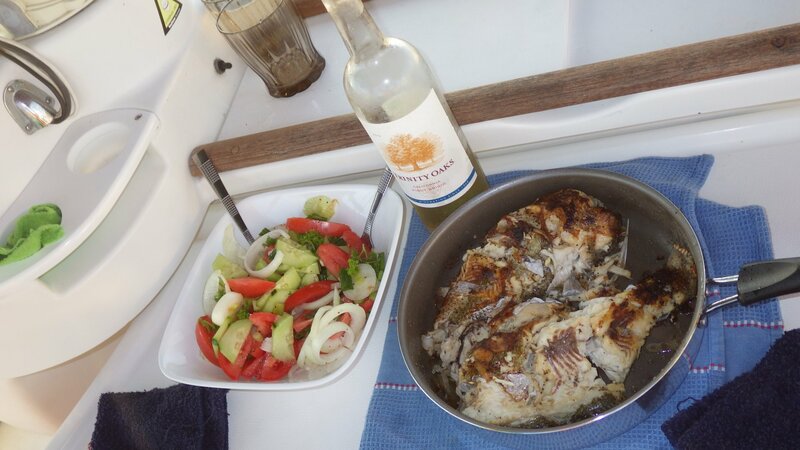 It was a great dinner next evening. 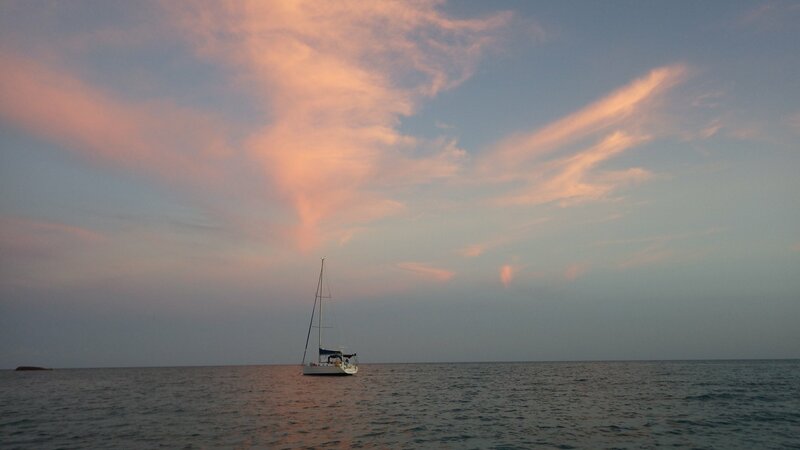 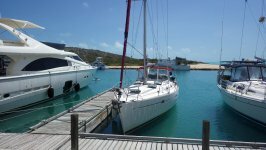 Stayed at Sapodilla Bay anchorage 2 days. 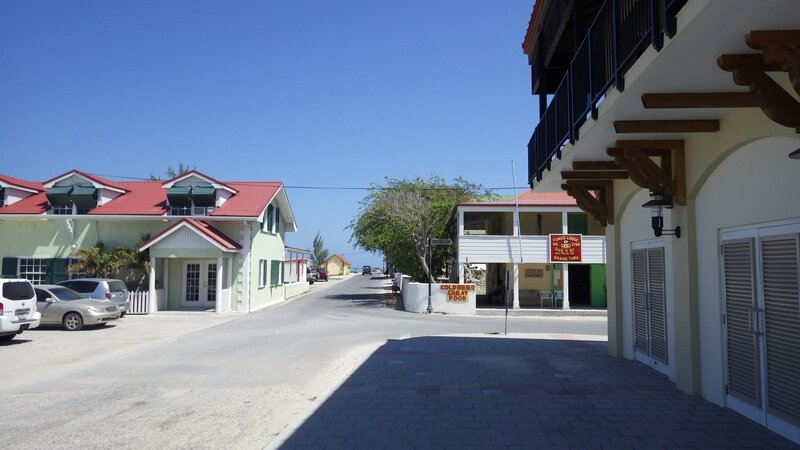 Cleared customs, visited 'downtown', walked around, had a lunch and provisioned there. 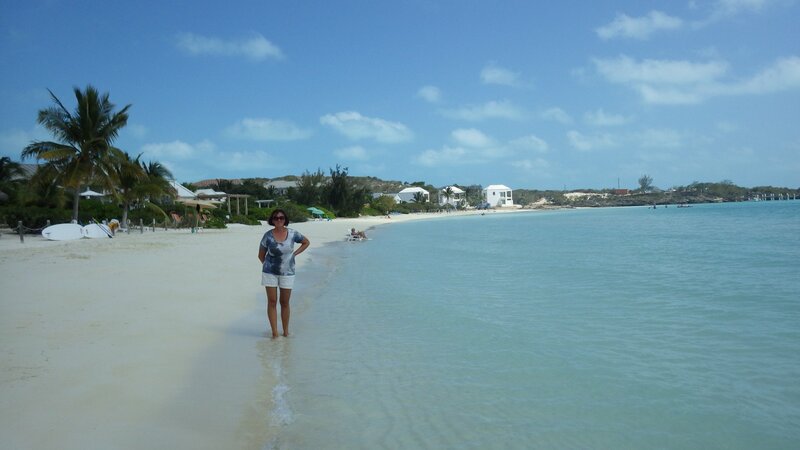 Also spent a great day at the bay's beach. 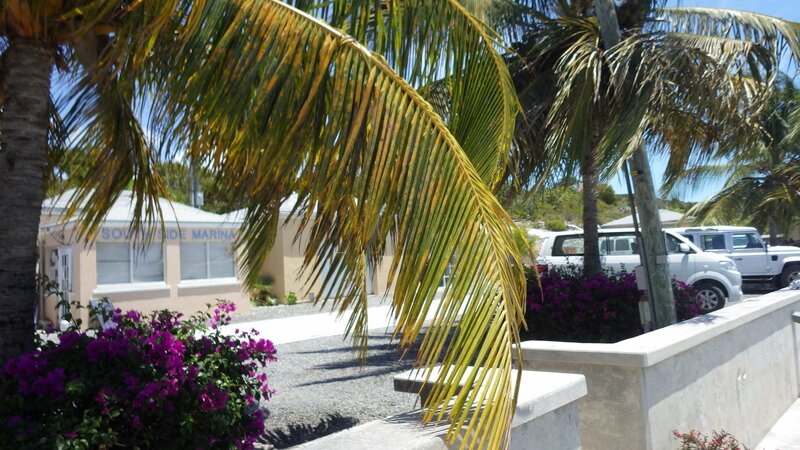 Went into the South Side Marina overnight, to fill water tanks, get propane, showers, do laundry. 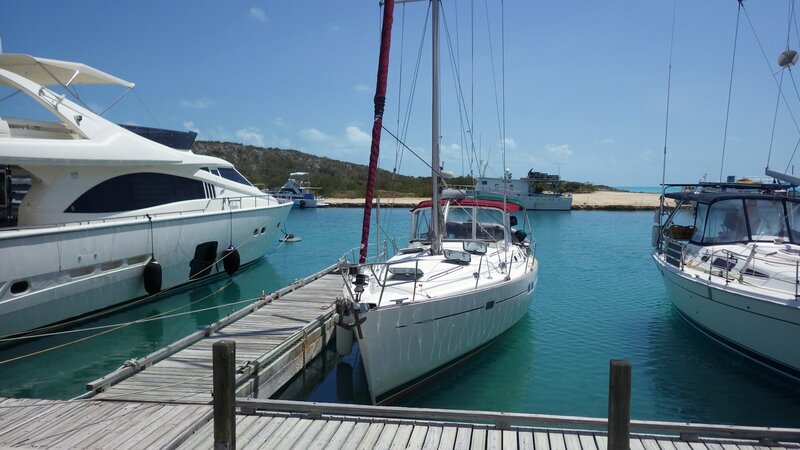 Staff at the Marina is very helpful, prices a reasonable. 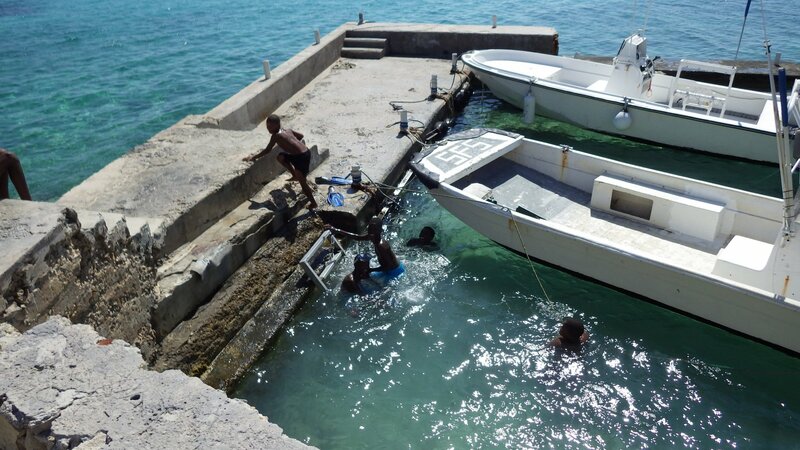 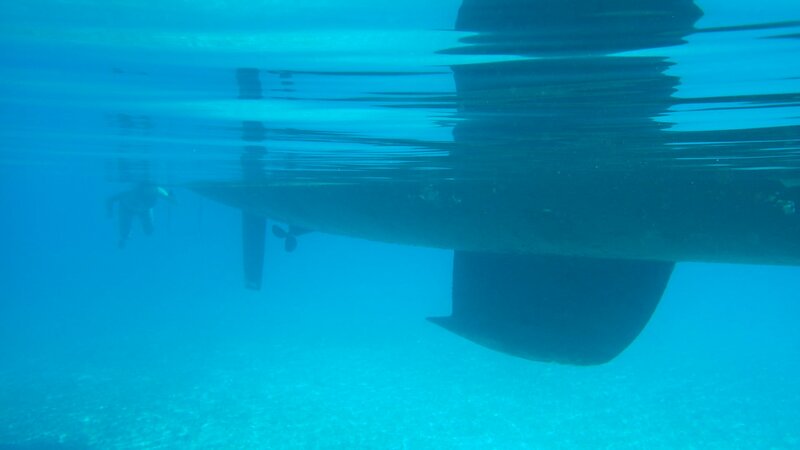 Although the approach to the marina is shallow, so we have to be sure we enter and leave at mid or high tide. 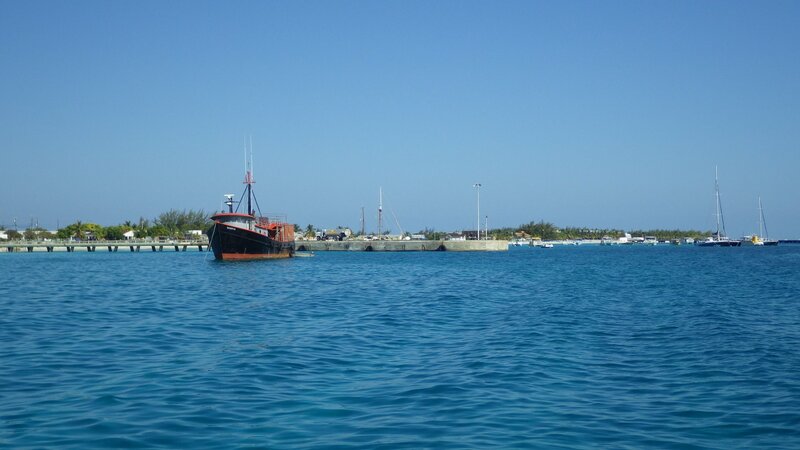 Dredging work to deepen the channel was under way. 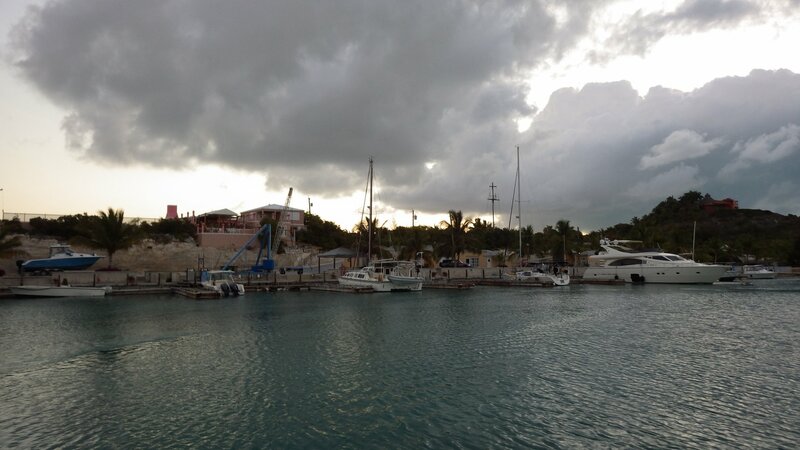 Visited the shopping area nearby, courtesy of the free ride by the Bob, marina's owner. 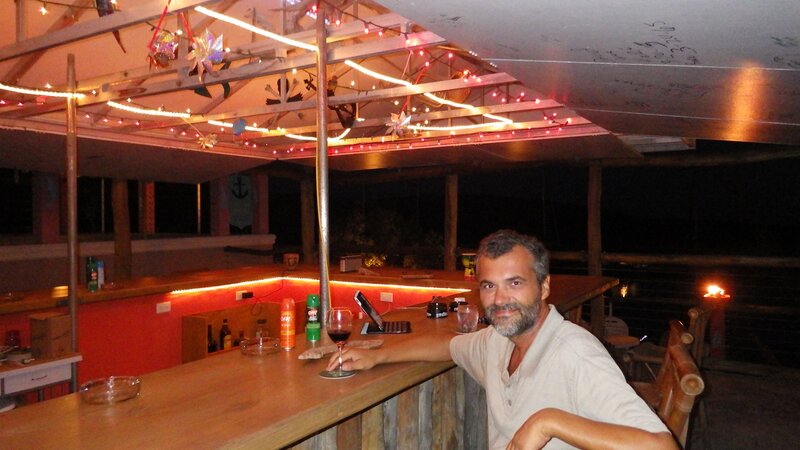 Spent a delightful evening at the Bob's bar � no one else around, picked our own music. 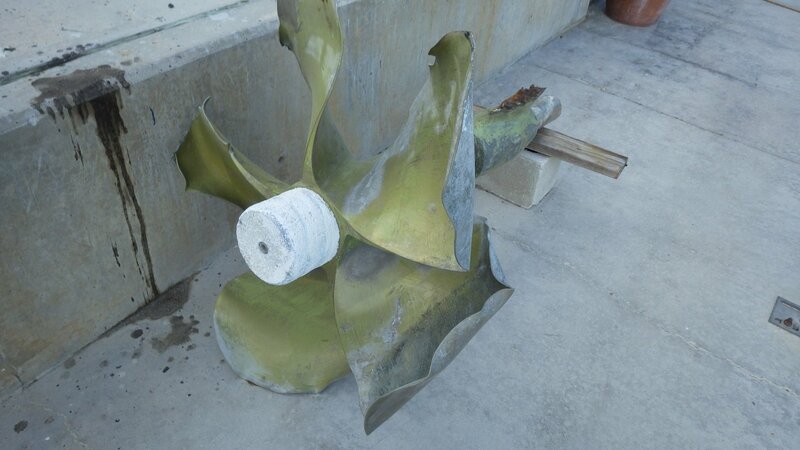 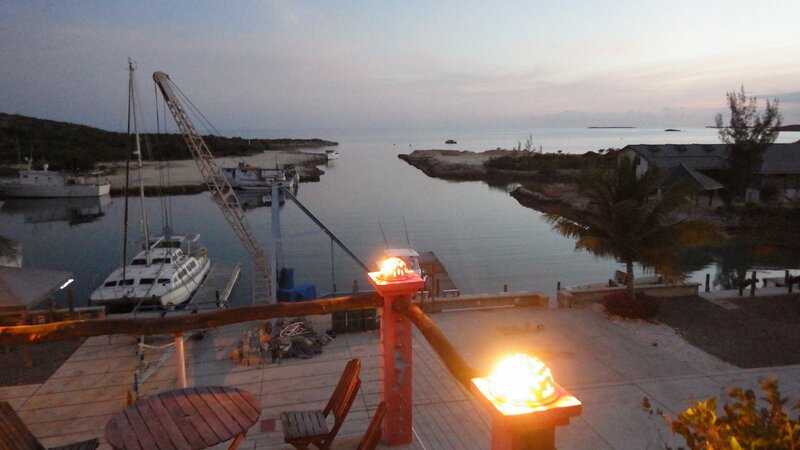 Unfortunately, we didn't realize in time to cover ports that the area is full of mosquitoes � had a sleepless night. 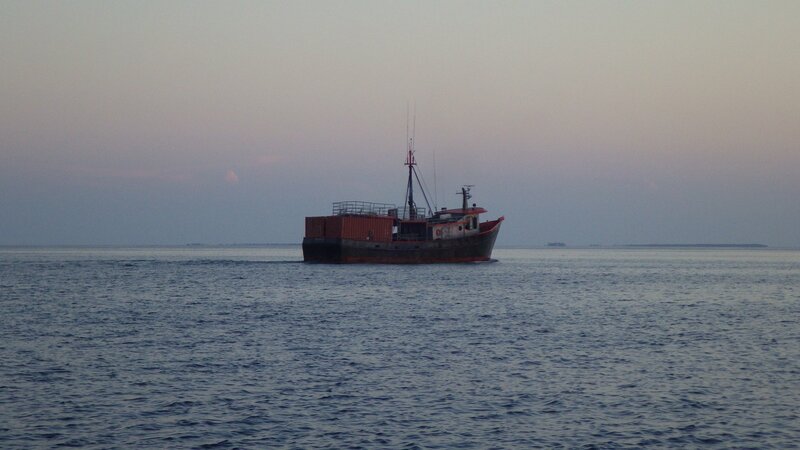 It was the rare long period of delightful calm weather, with no waves and no wind. 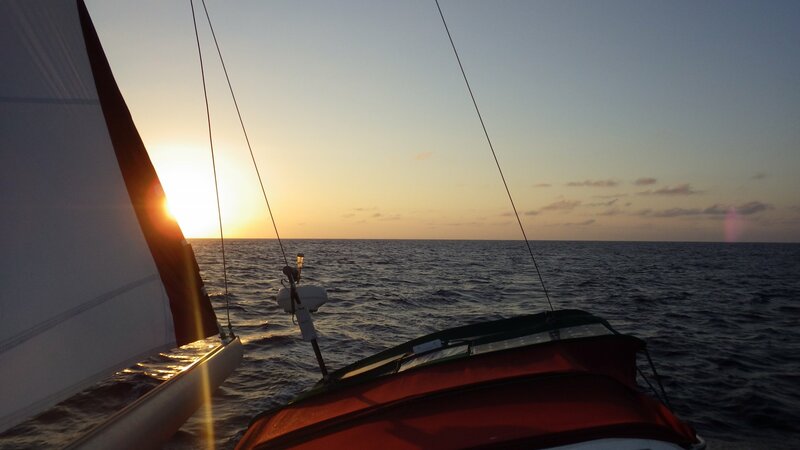 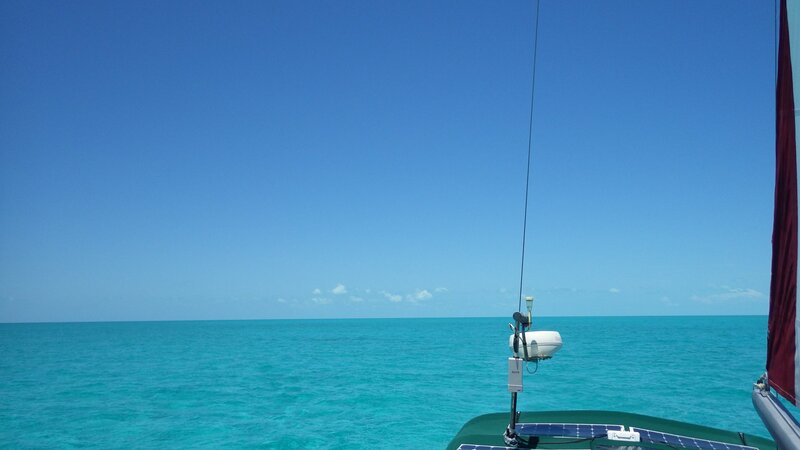 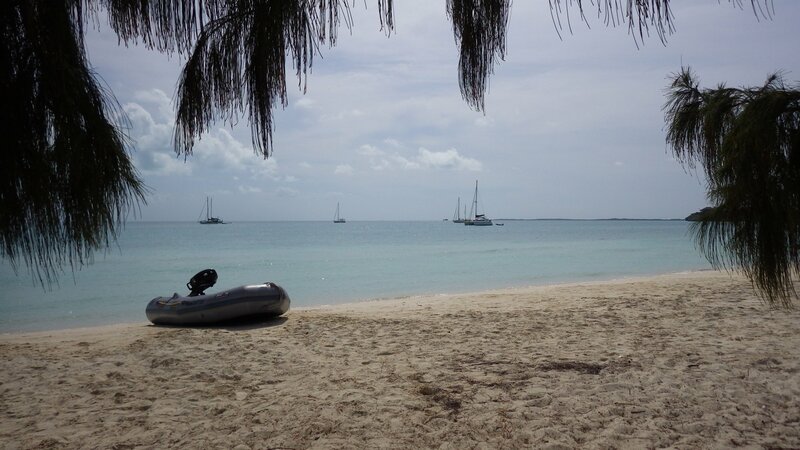 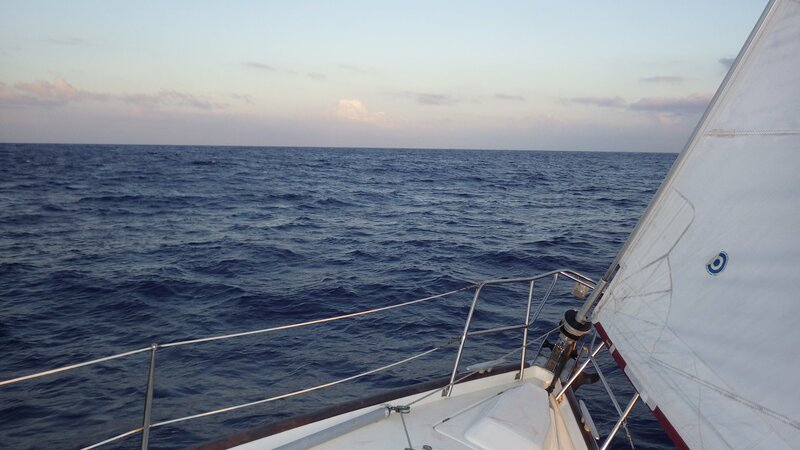 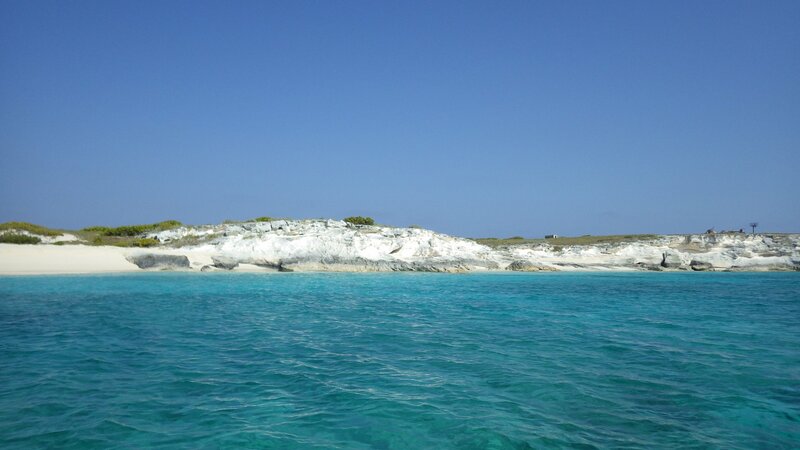 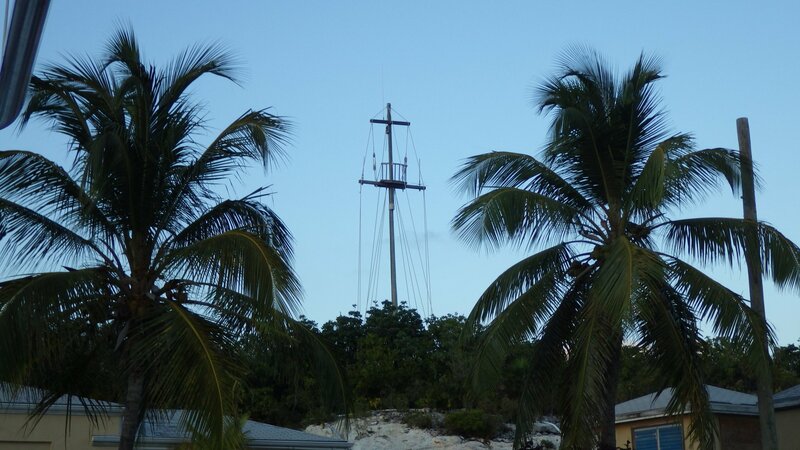 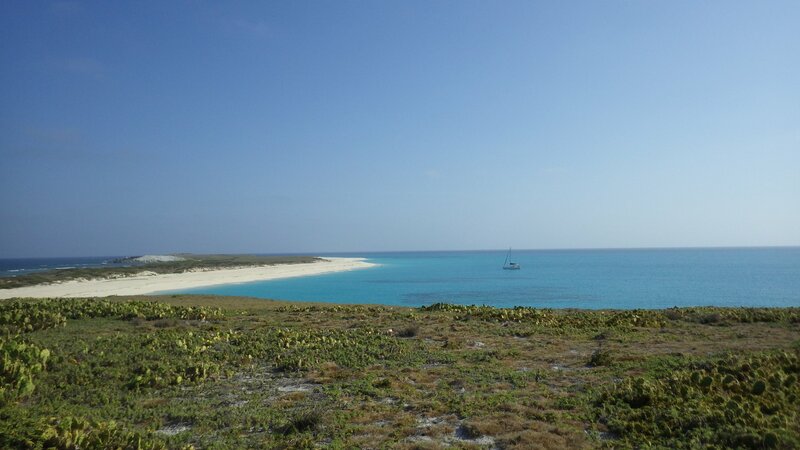 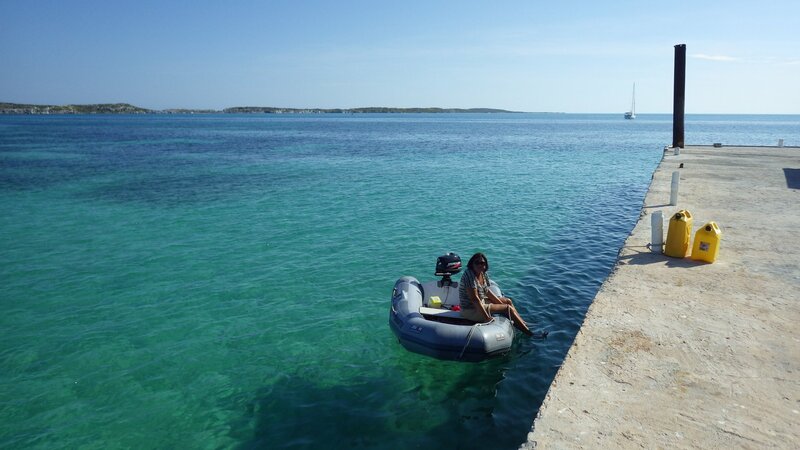 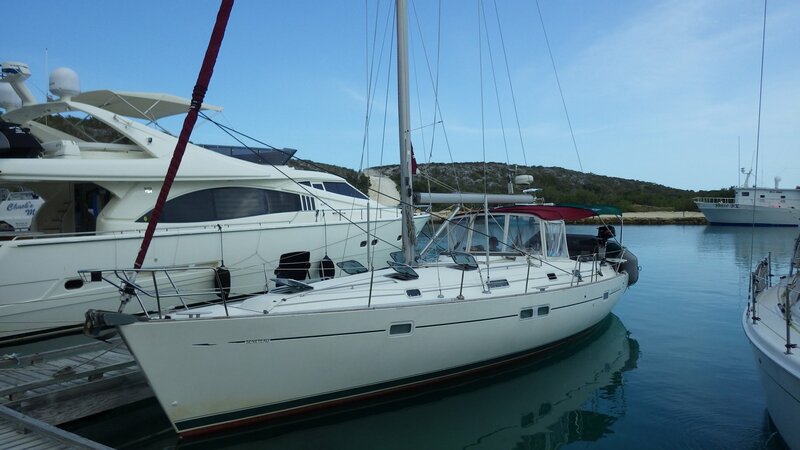 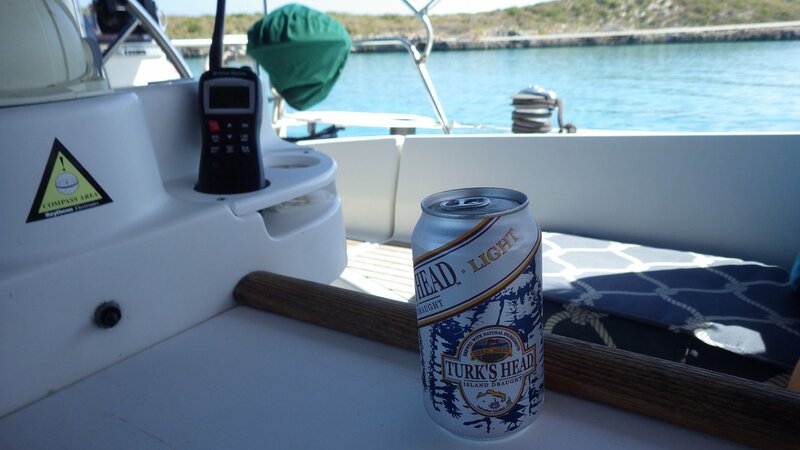 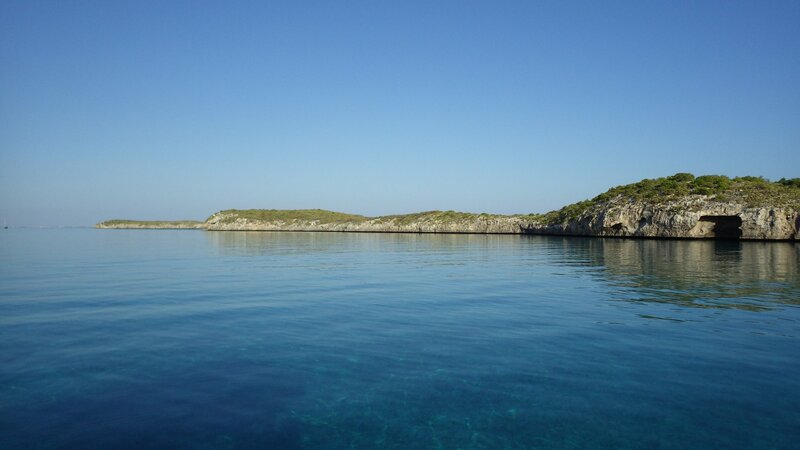 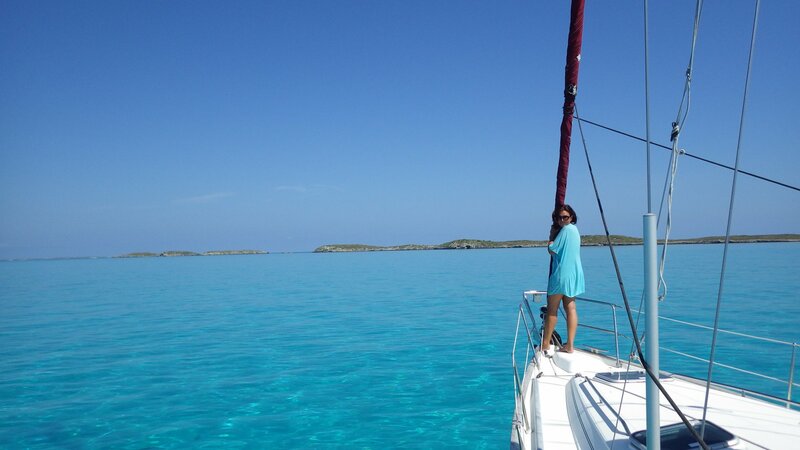 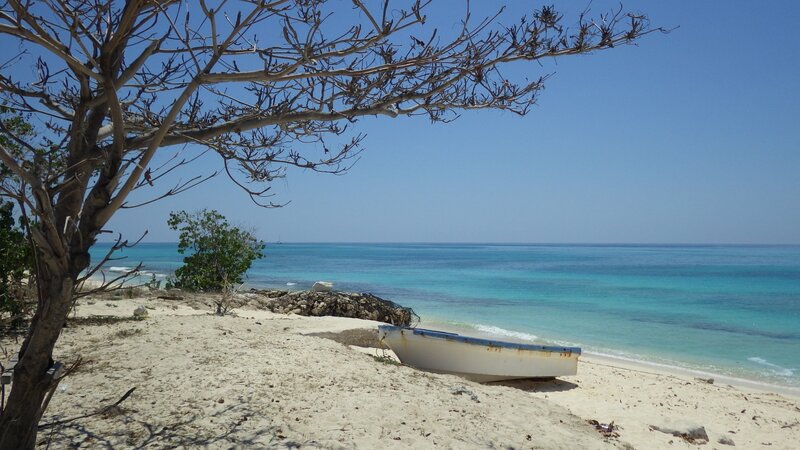 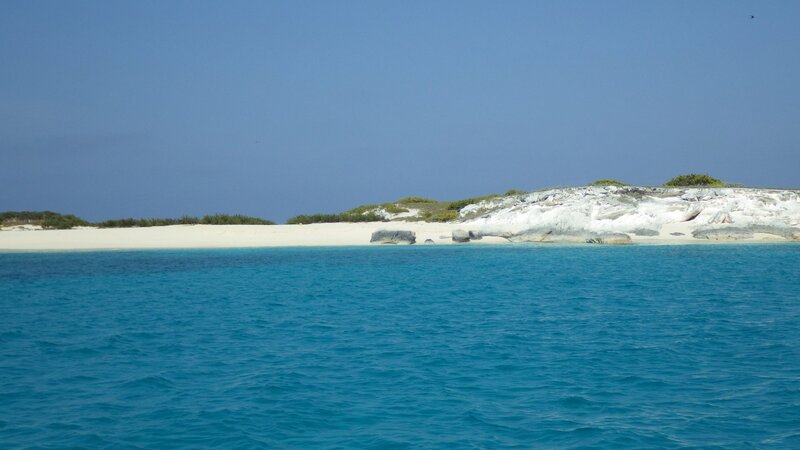 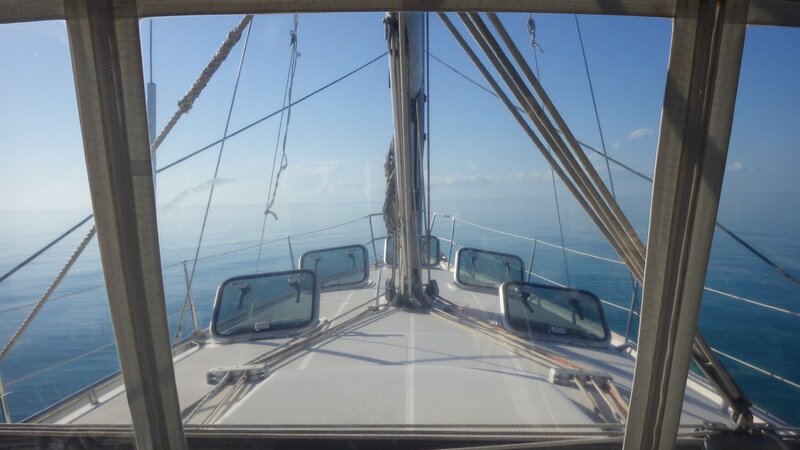 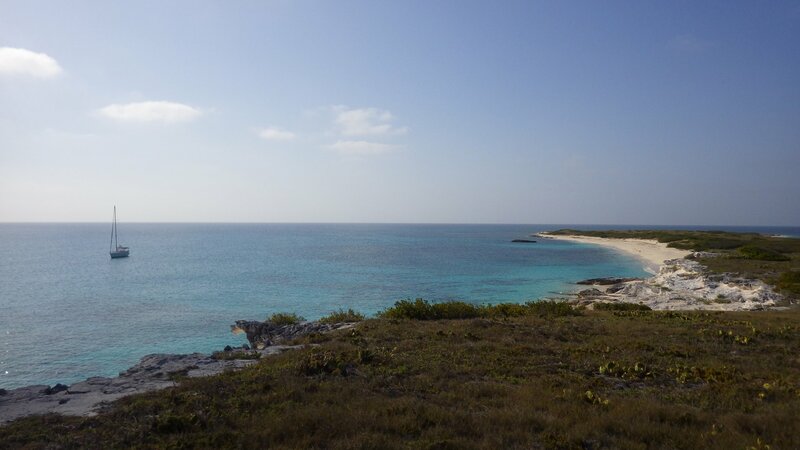 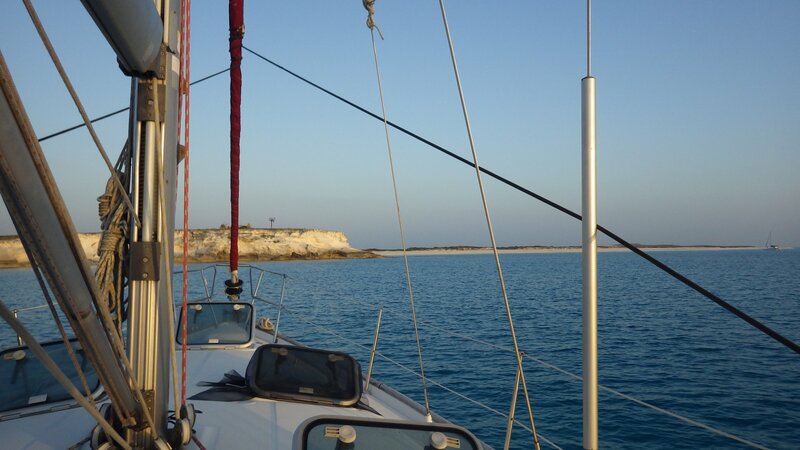 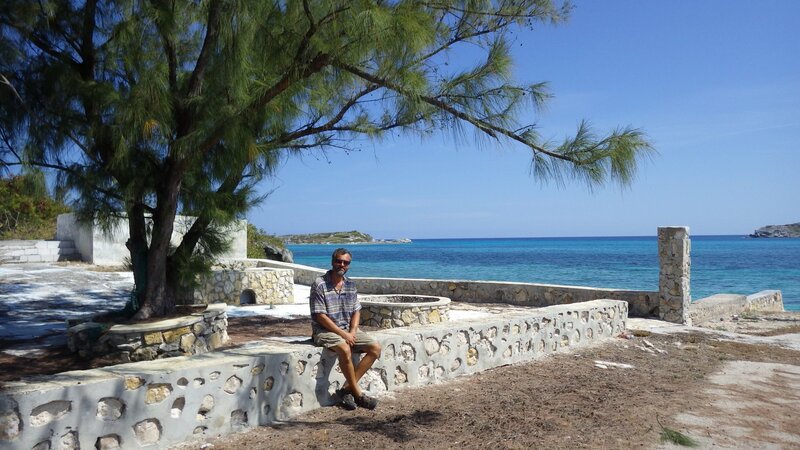 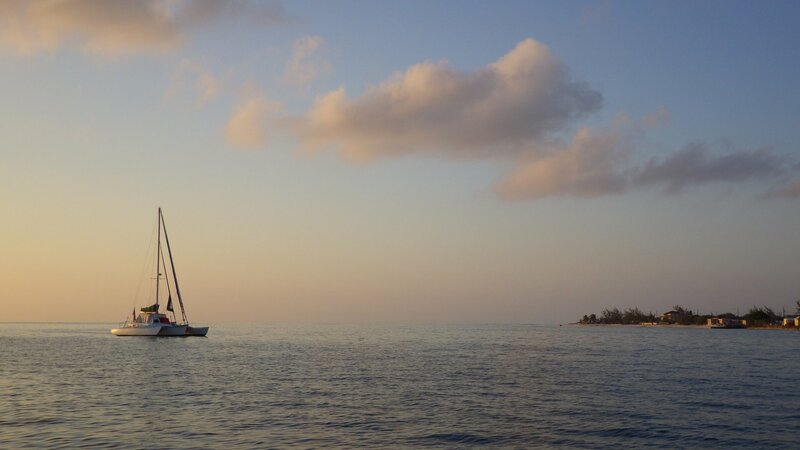 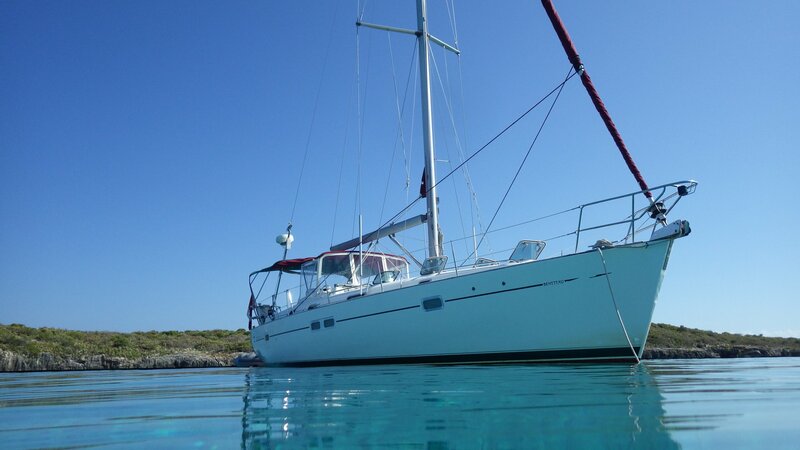 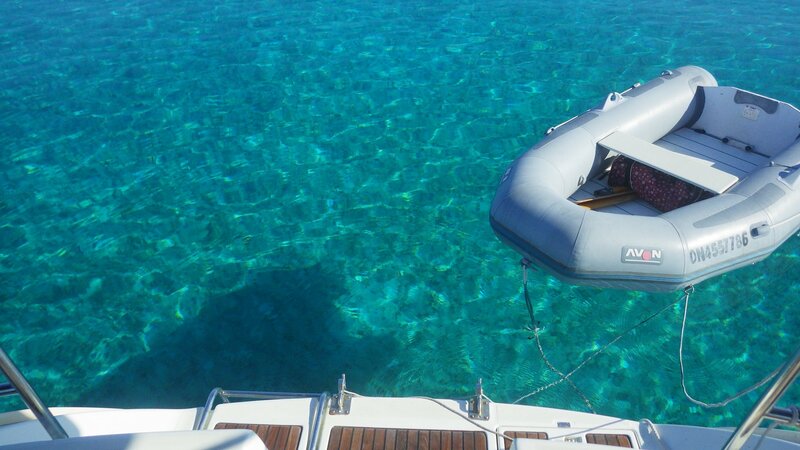 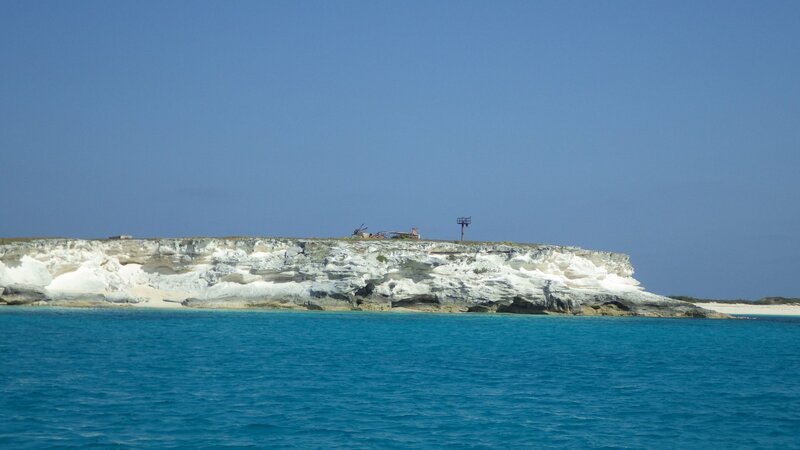 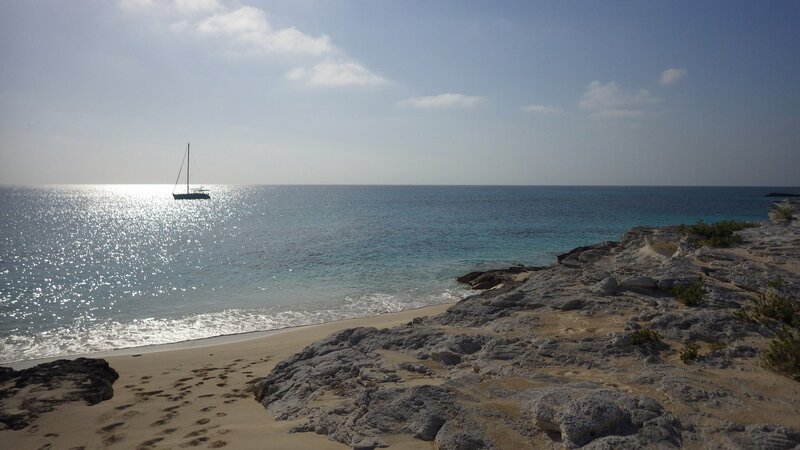 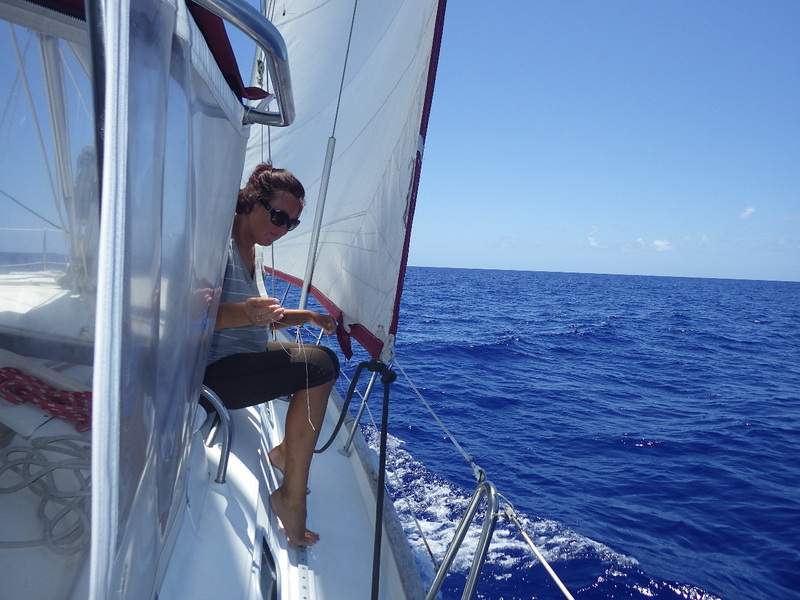 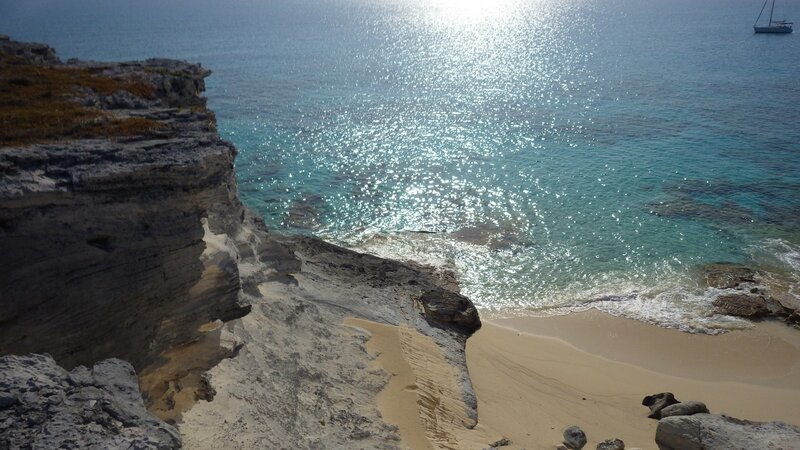 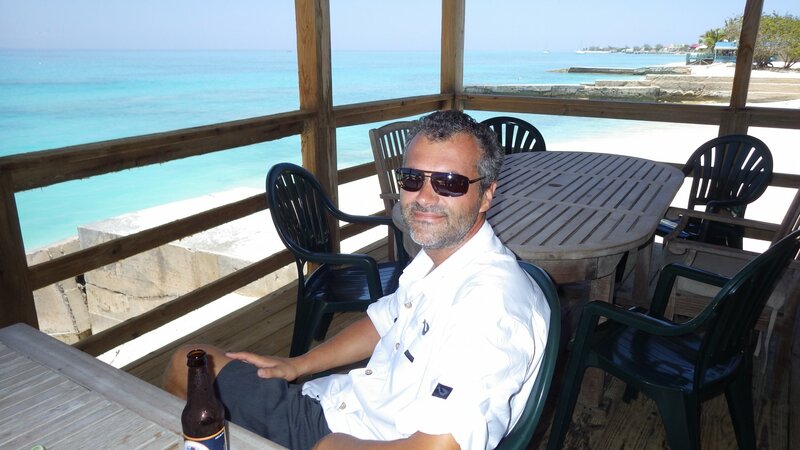 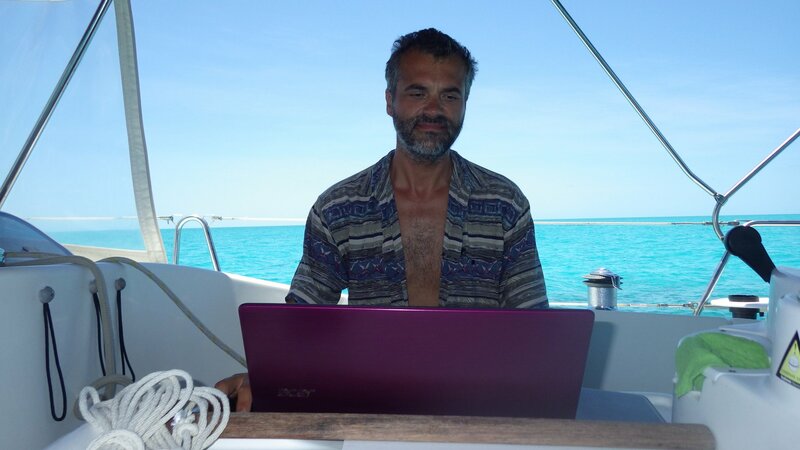 The drawback - we couldn't sail without wind, so had to motor ~40 miles across the Caicos Bank to the Six Hill Cays. 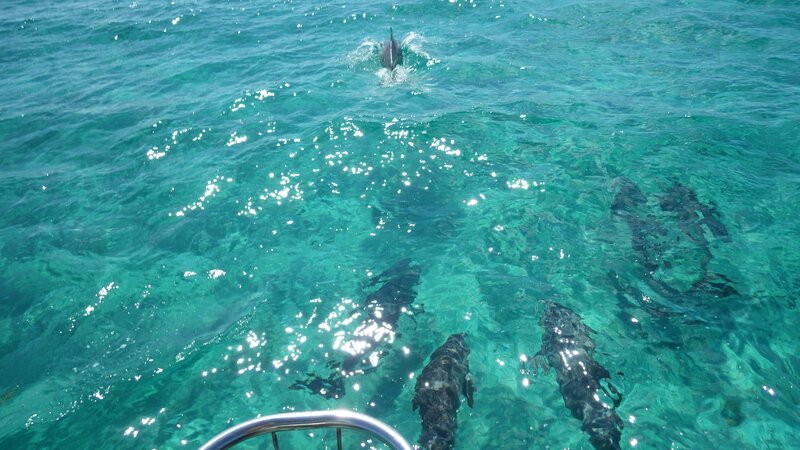 A group of several dolphins playfully followed our boat for some time. 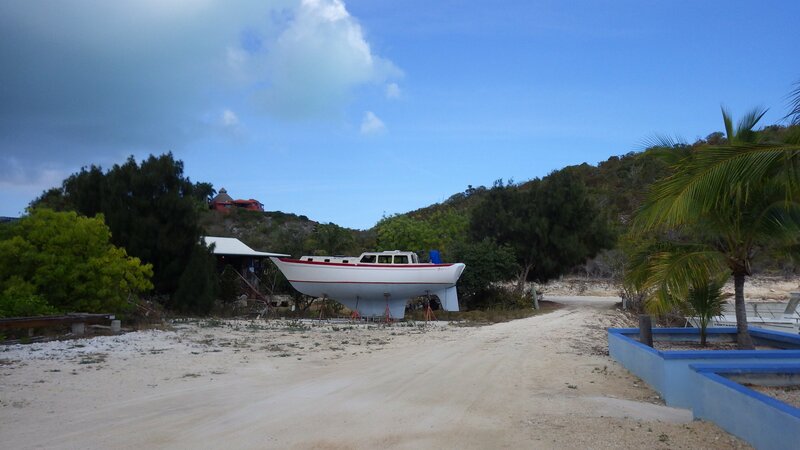 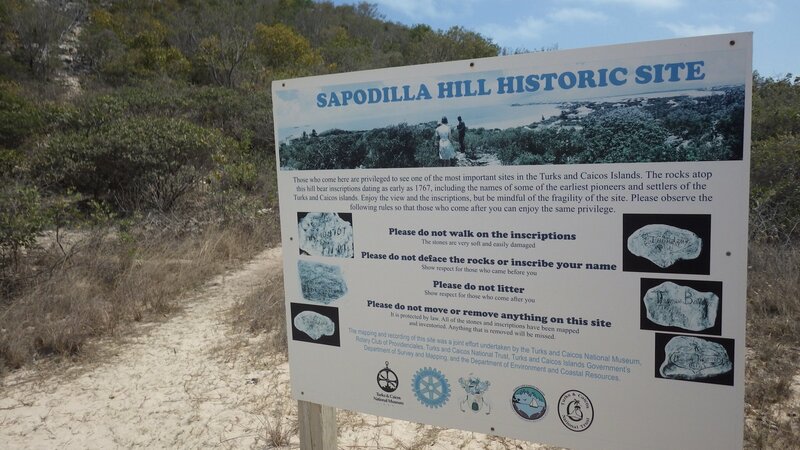 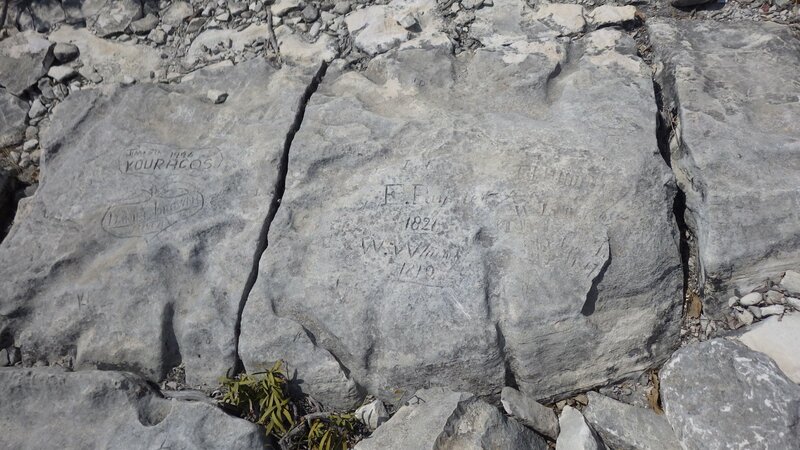 Six Hill Cays is the rarely visited place. 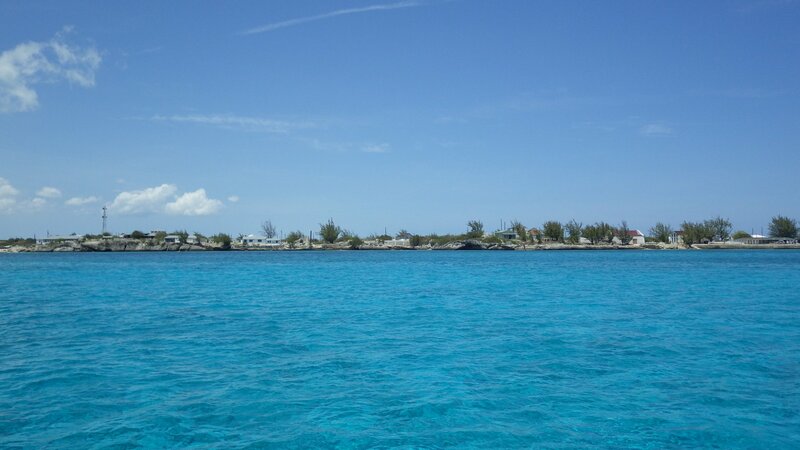 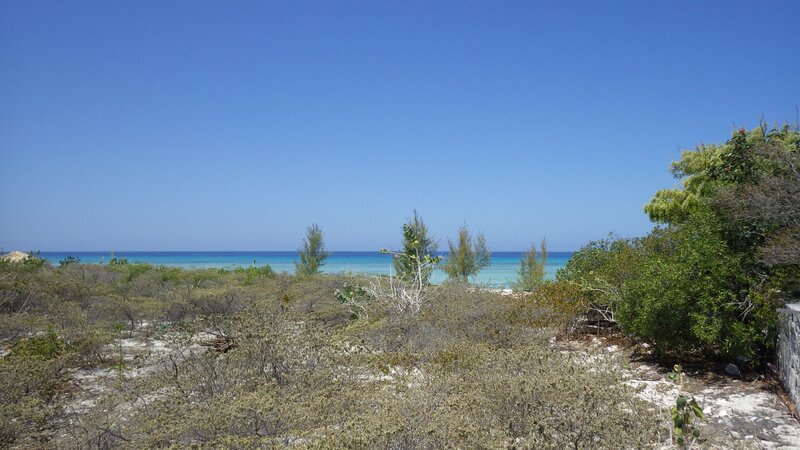 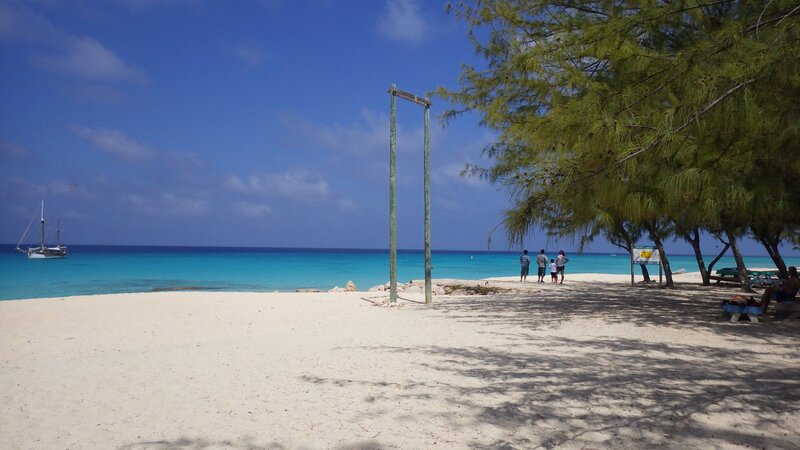 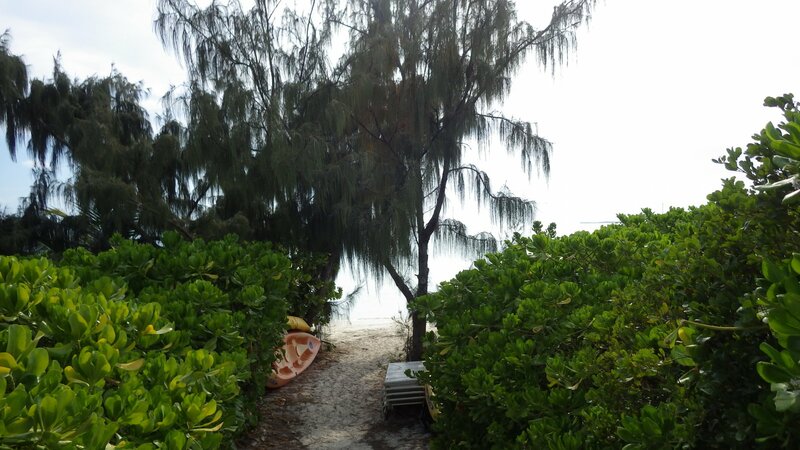 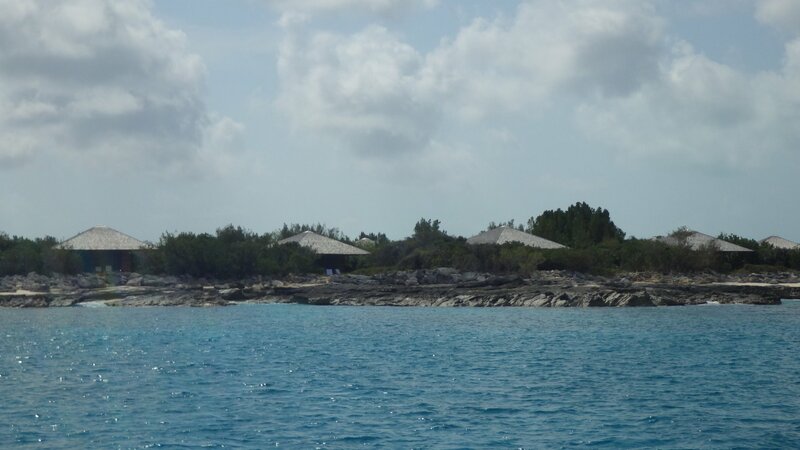 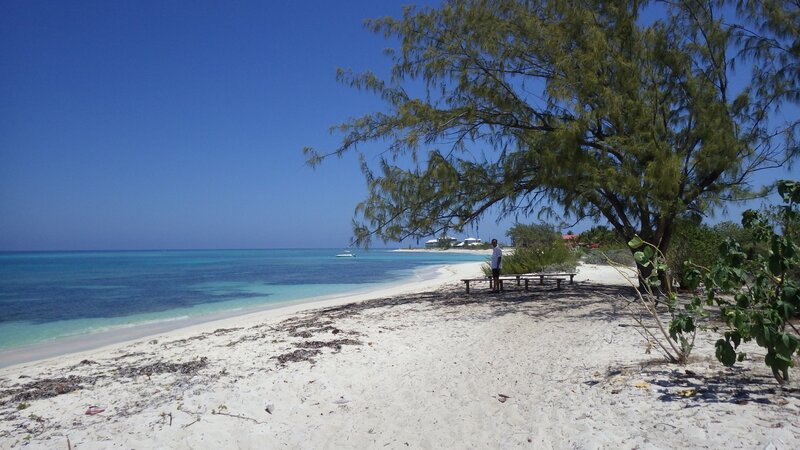 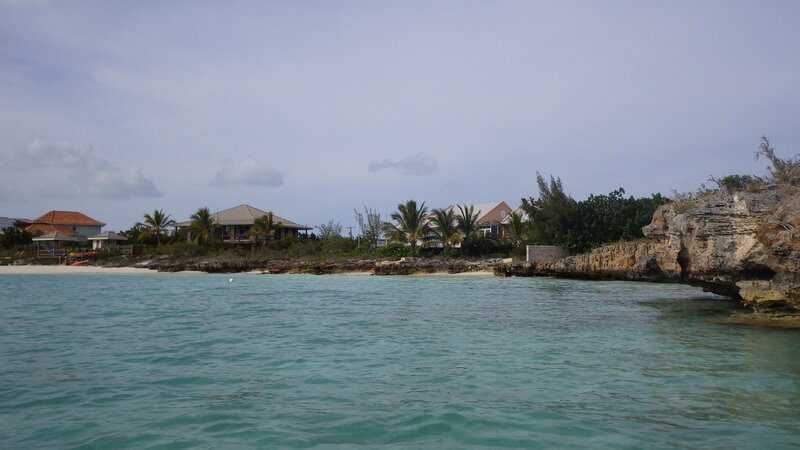 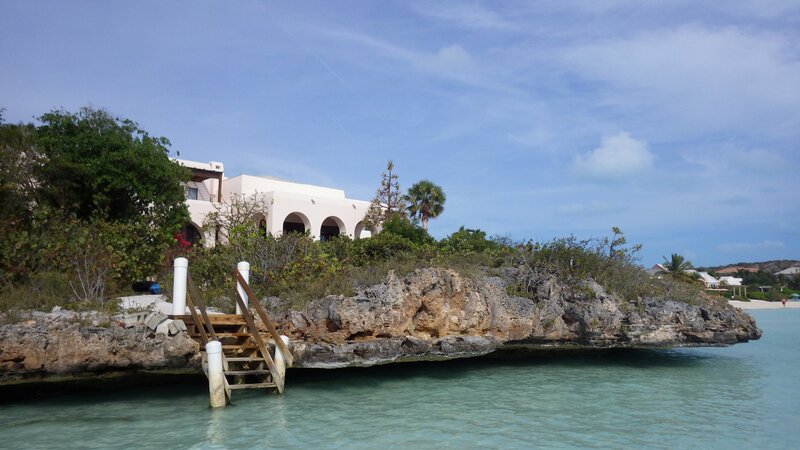 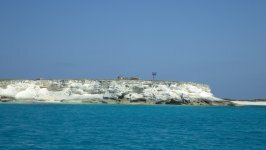 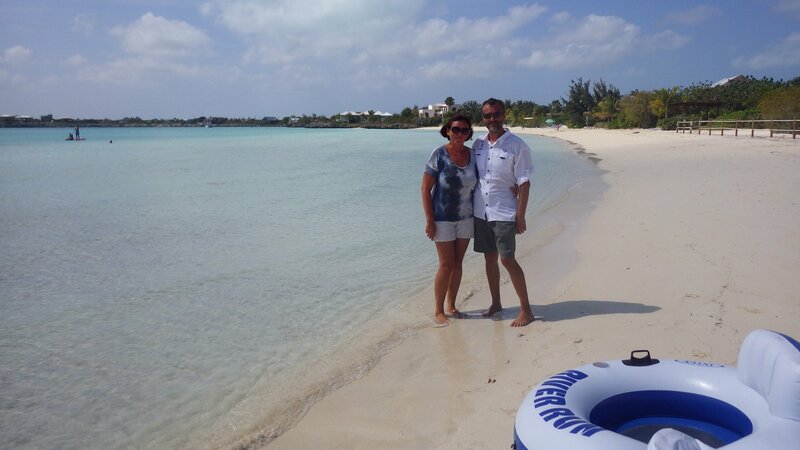 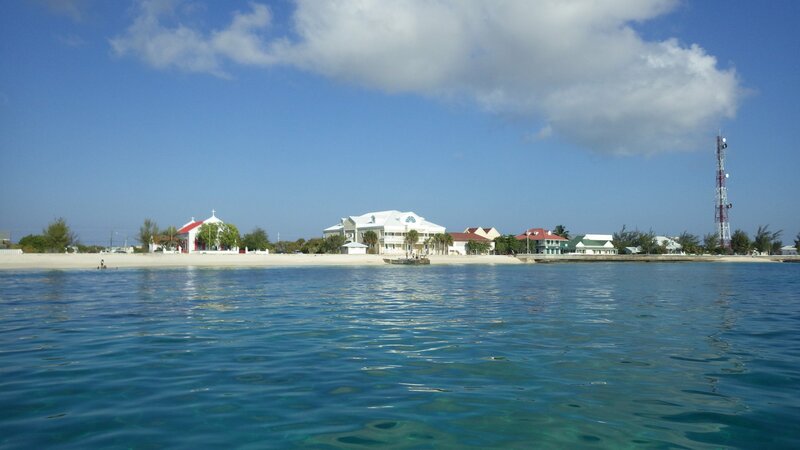 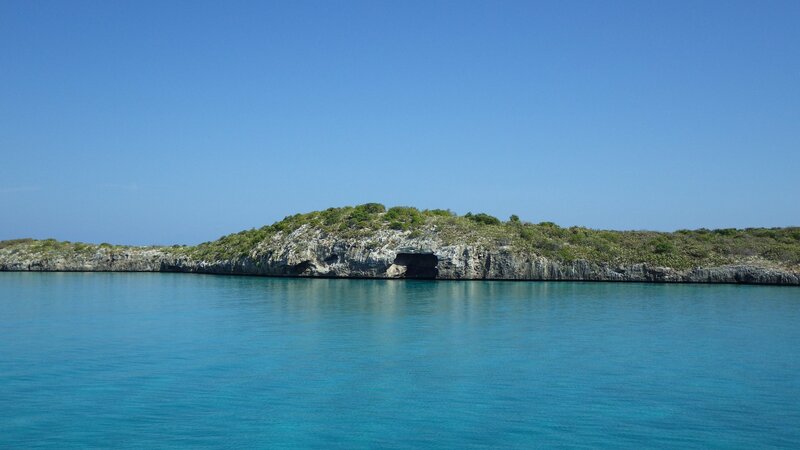 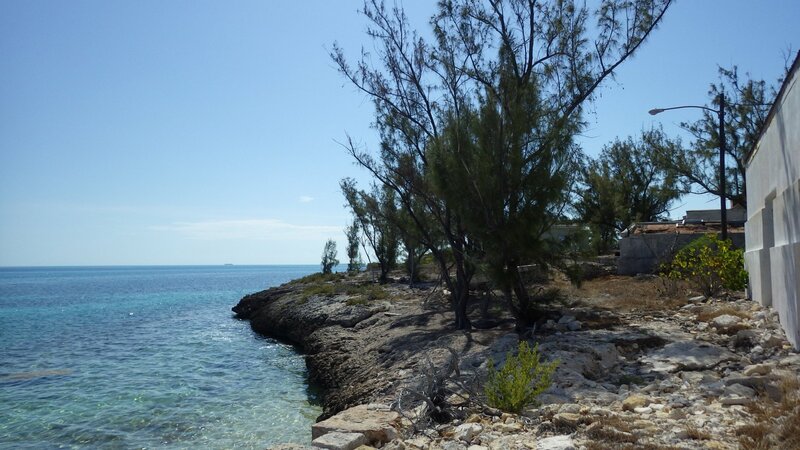 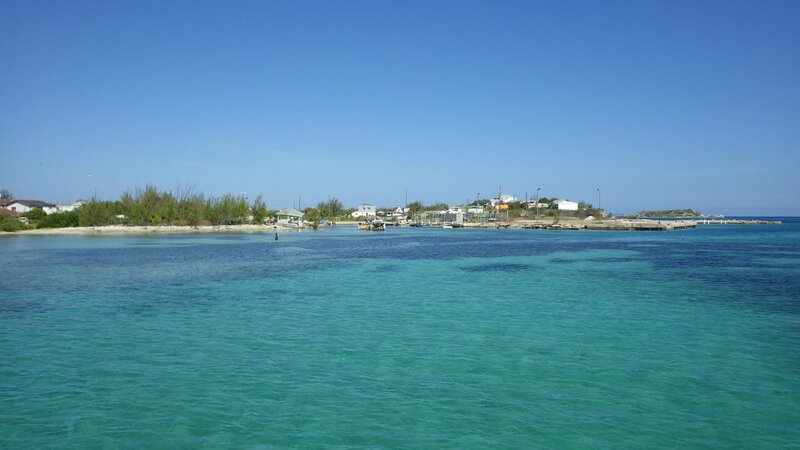 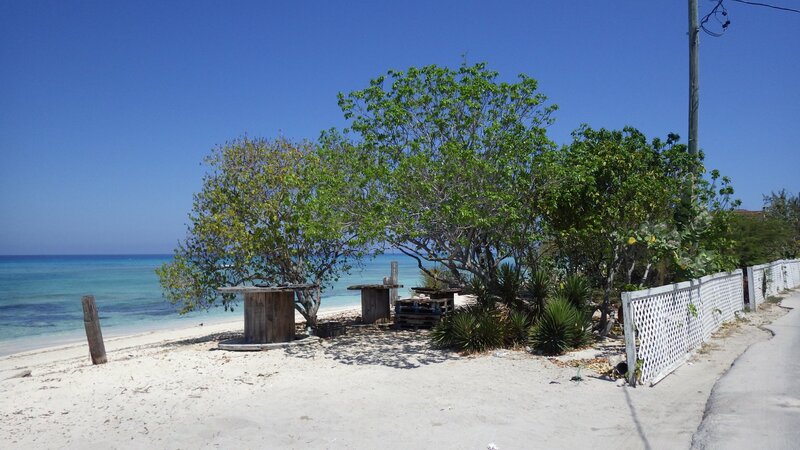 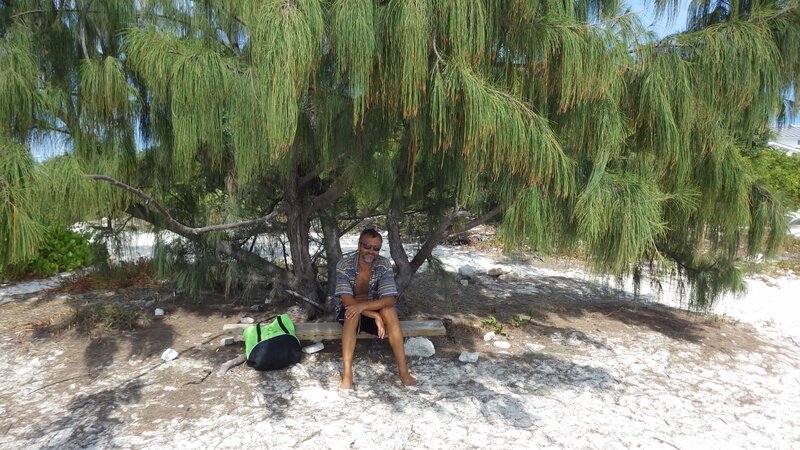 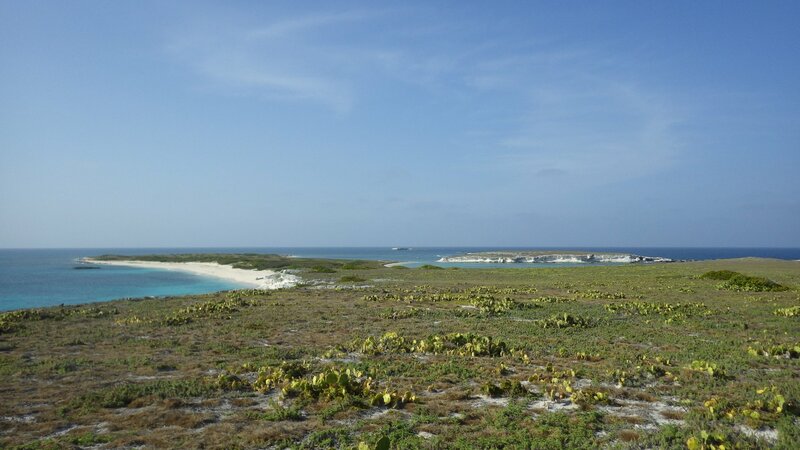 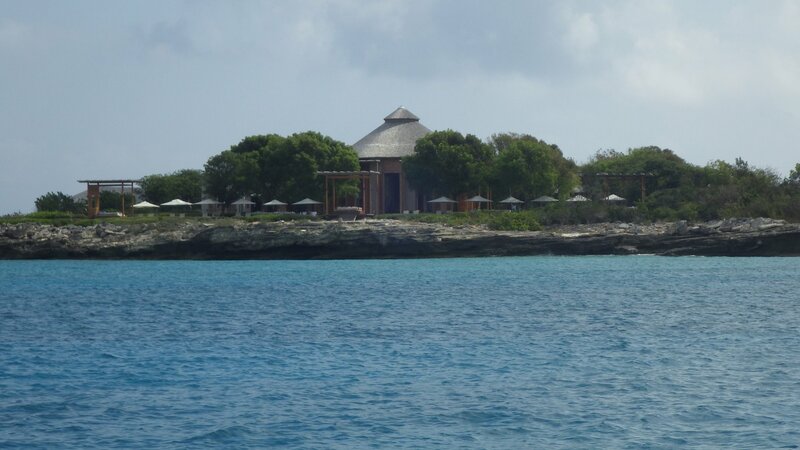 Just two cays - a nature reserve / bird sanctuary. 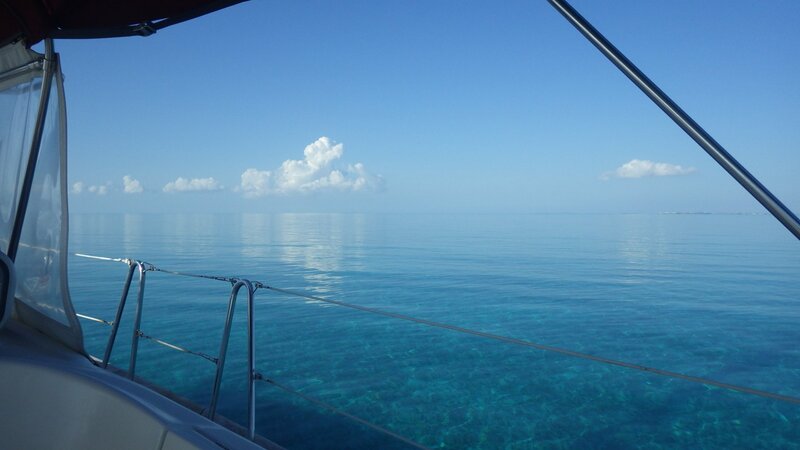 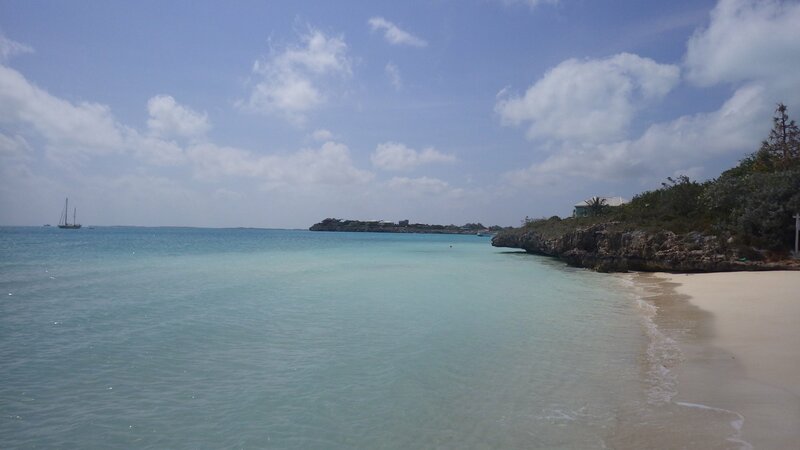 When we were arriving there, the water was clear and completely still like glass, and the sea bottom could be visible. 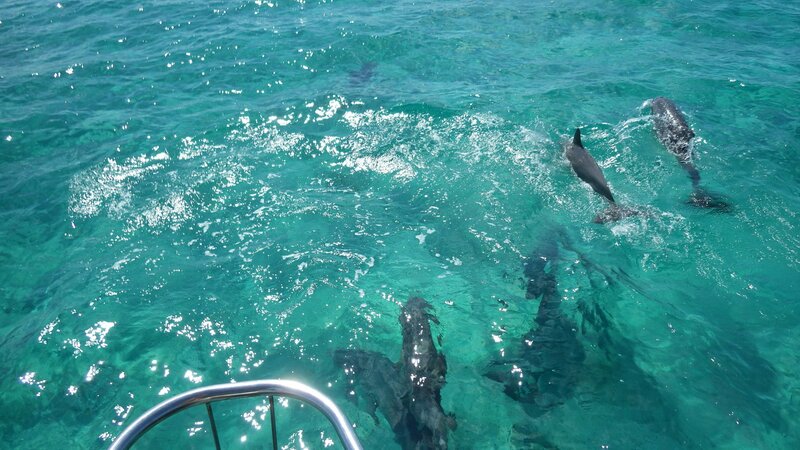 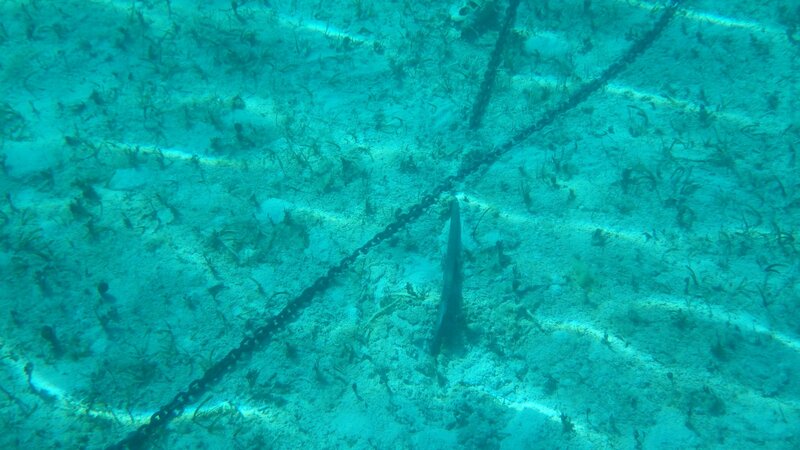 Seen few exotic birds, a group of large sting rays. 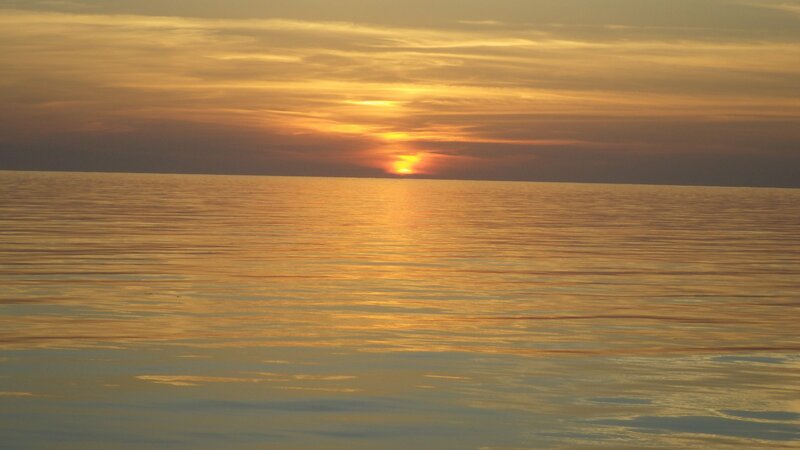 Had a very peasant swimming in the evening at sunset. 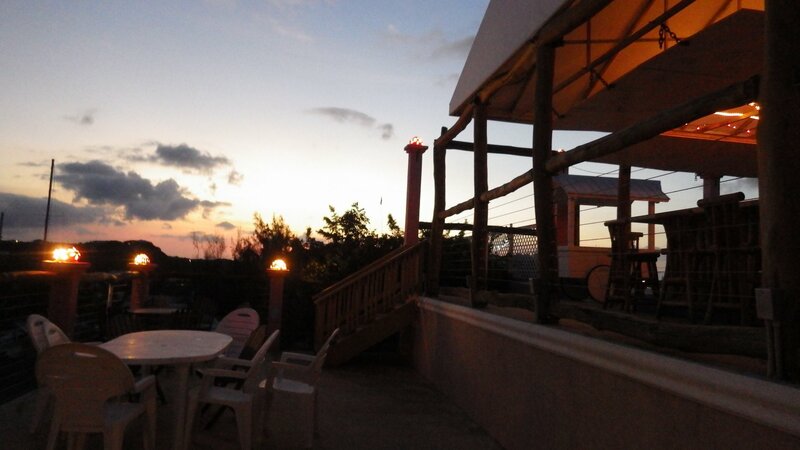 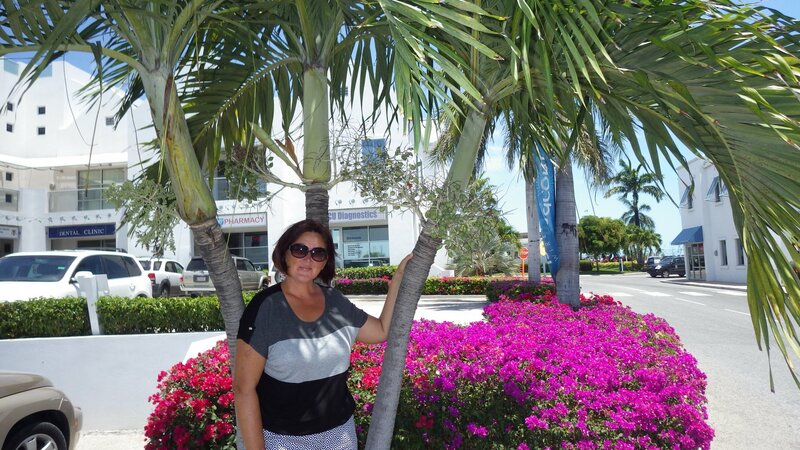 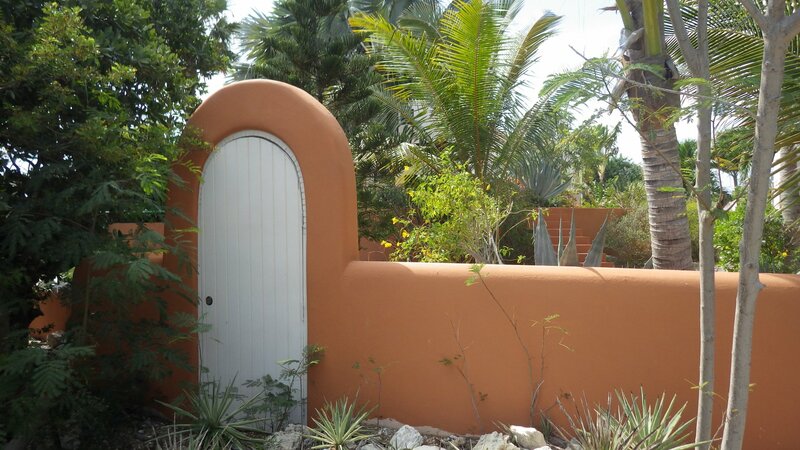 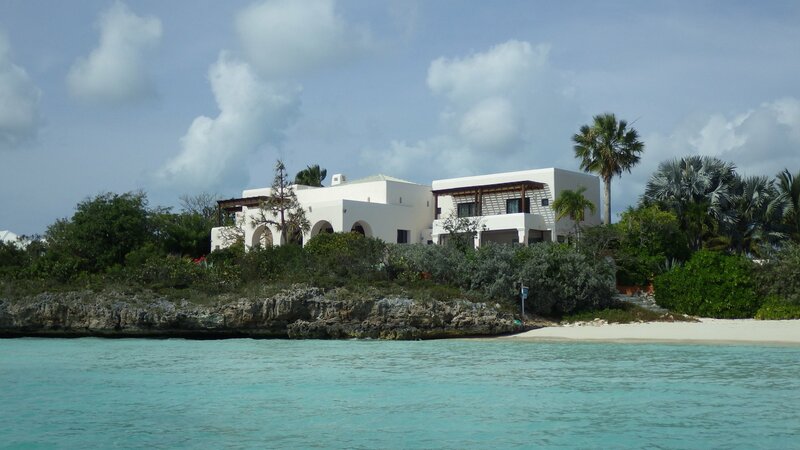 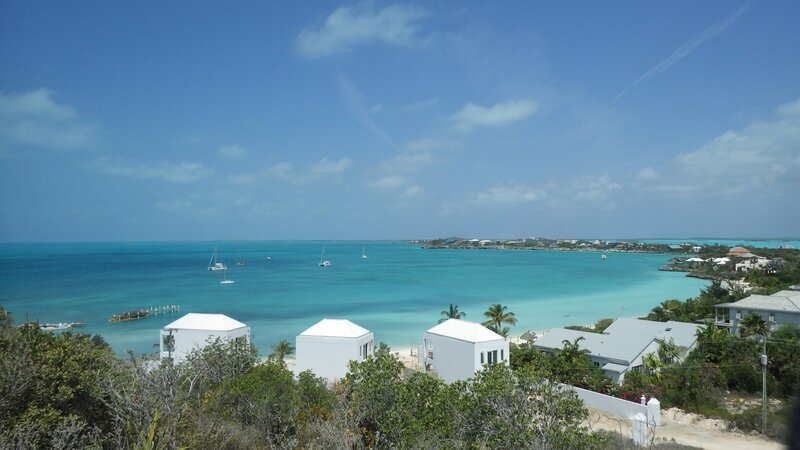 We wished to stay more here, but our 1-week stay in the Turks and Caicos soon to expire and we wanted to see more places, so we have to move on next day. 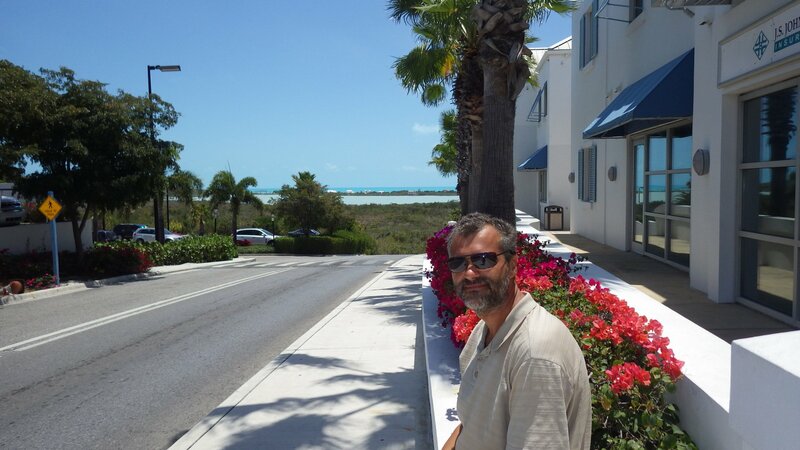 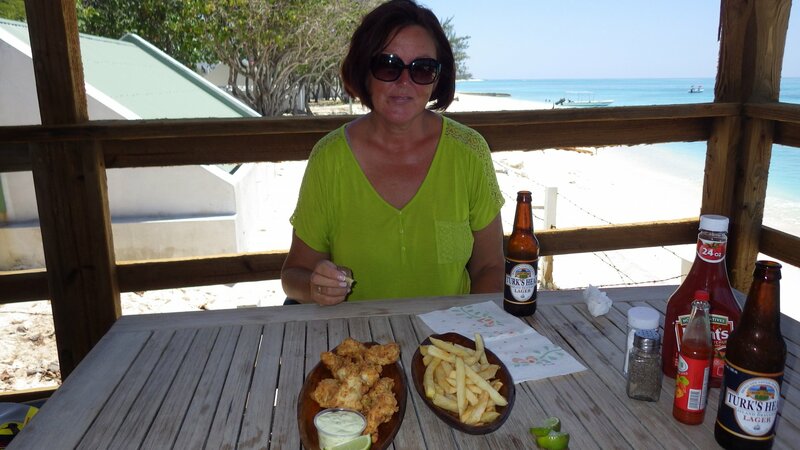 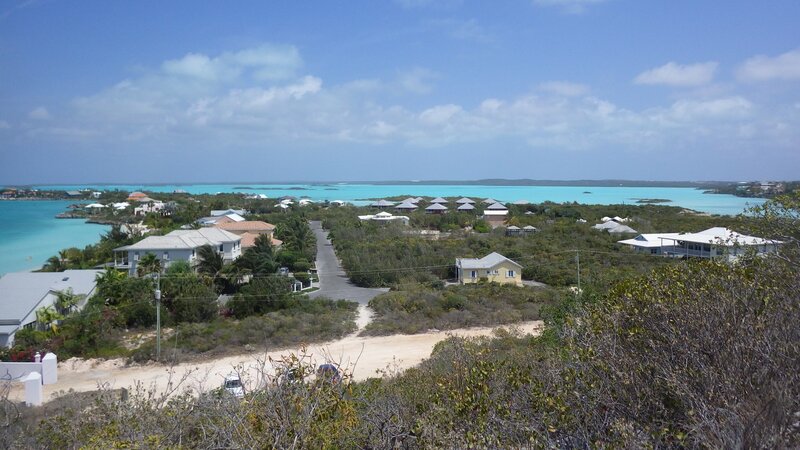 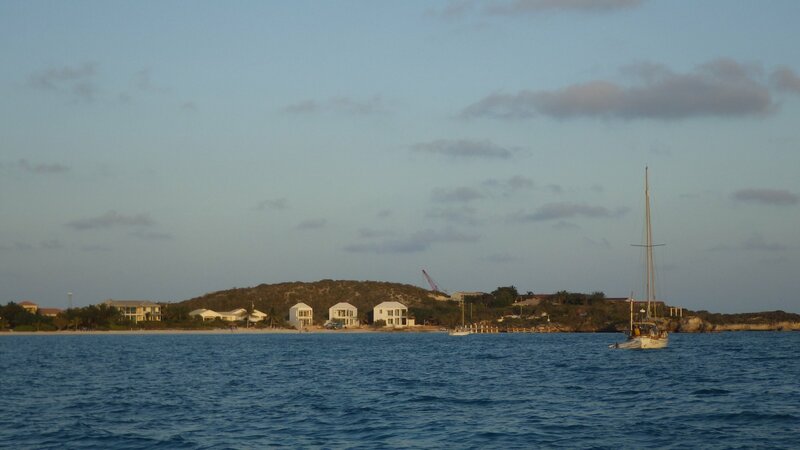 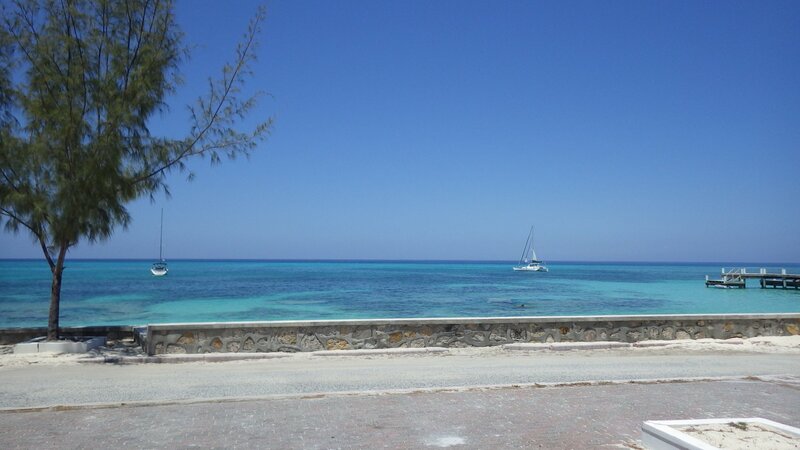 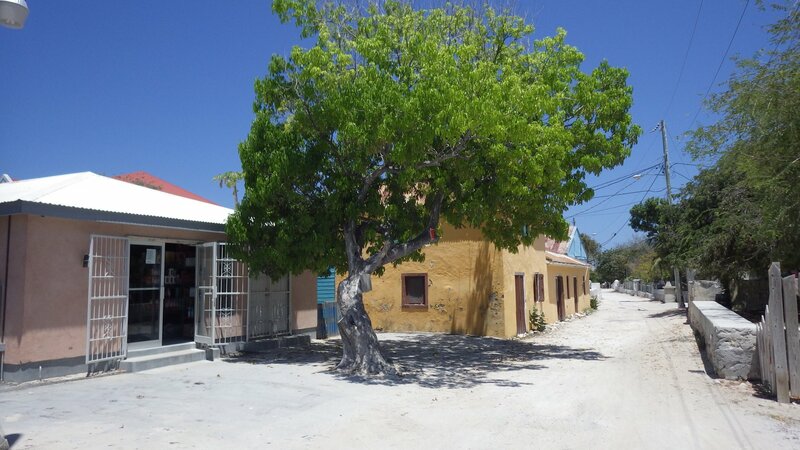 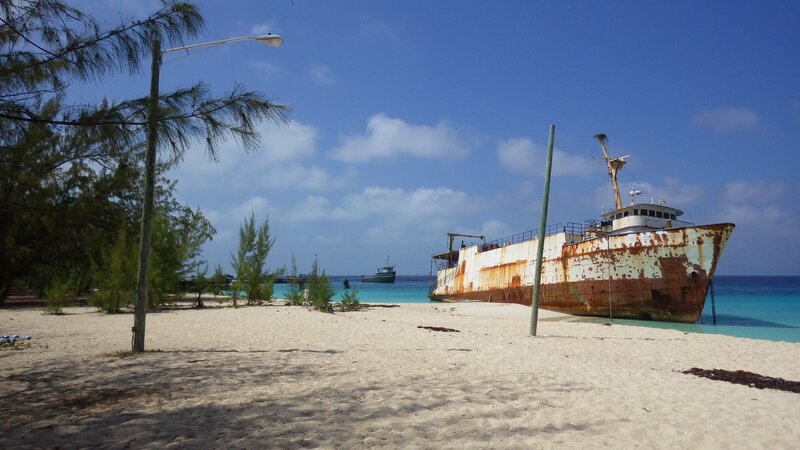 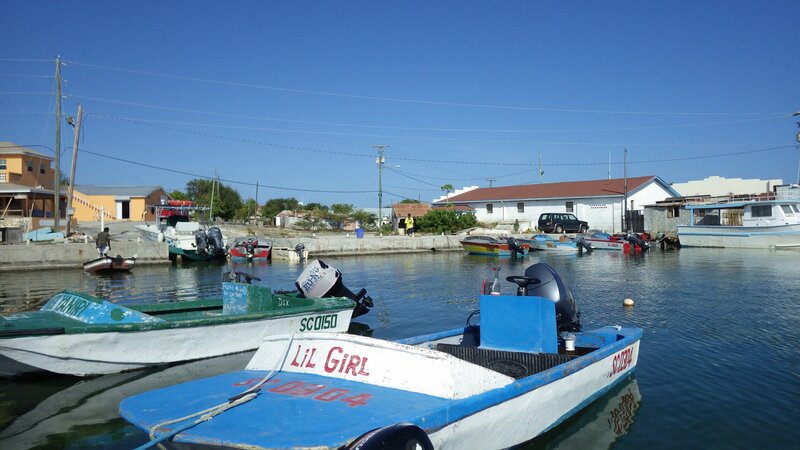 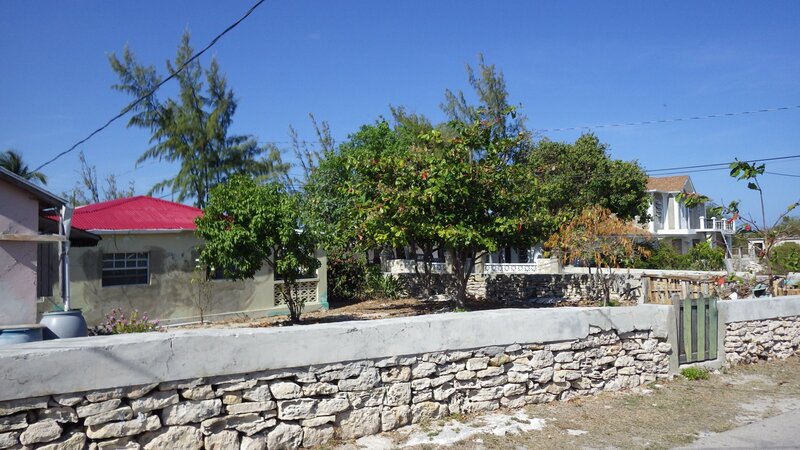 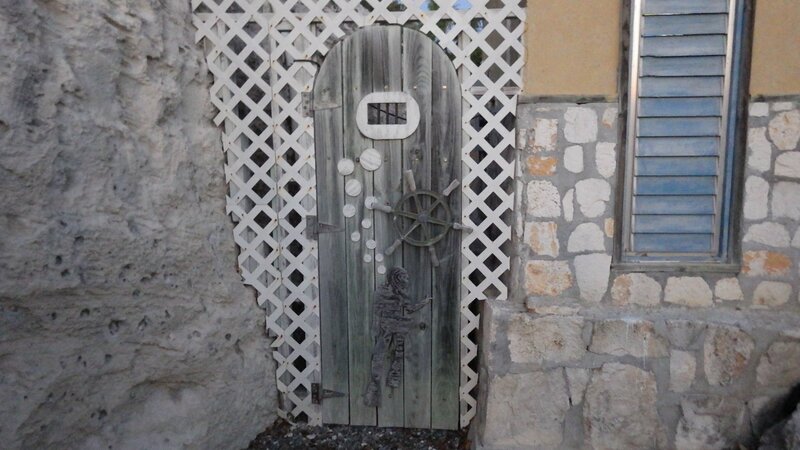 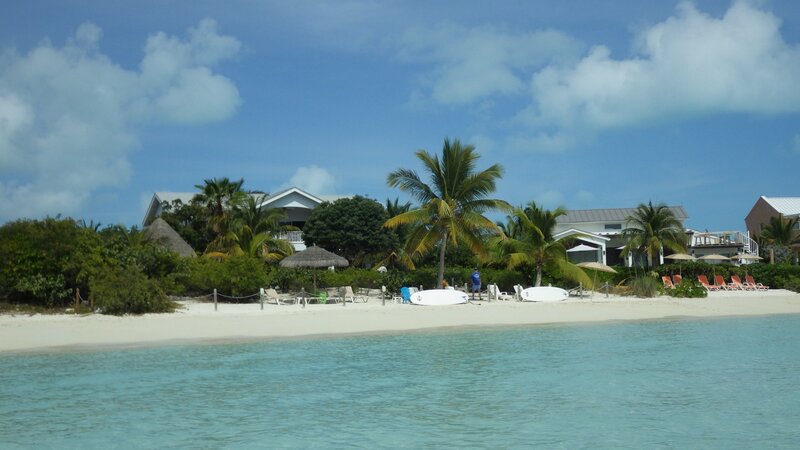 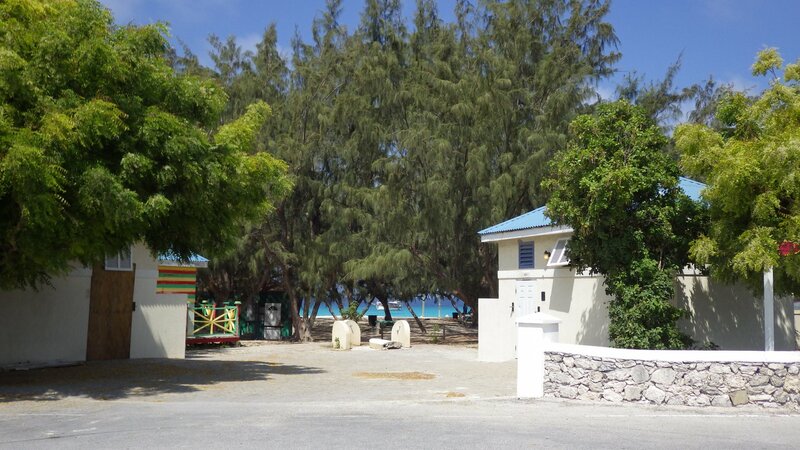 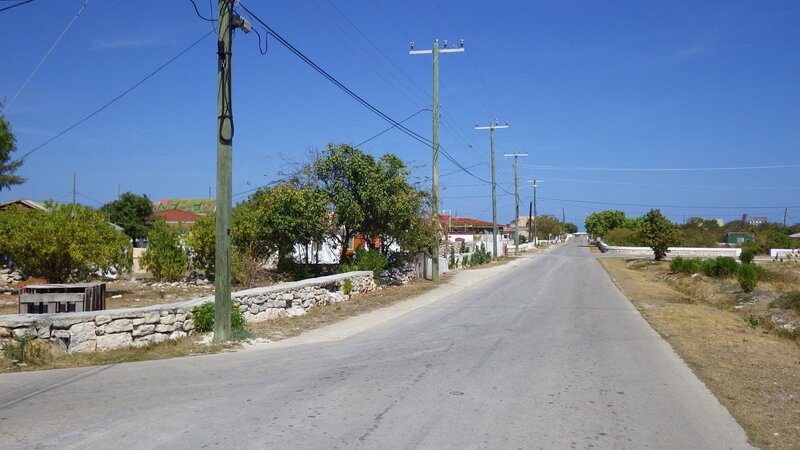 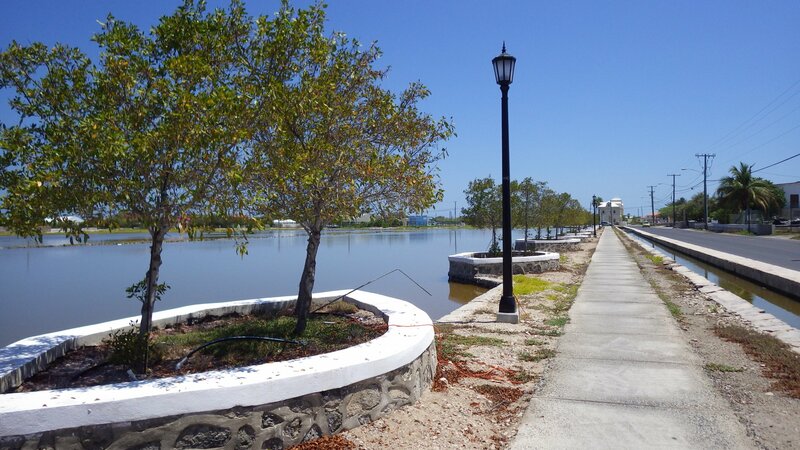 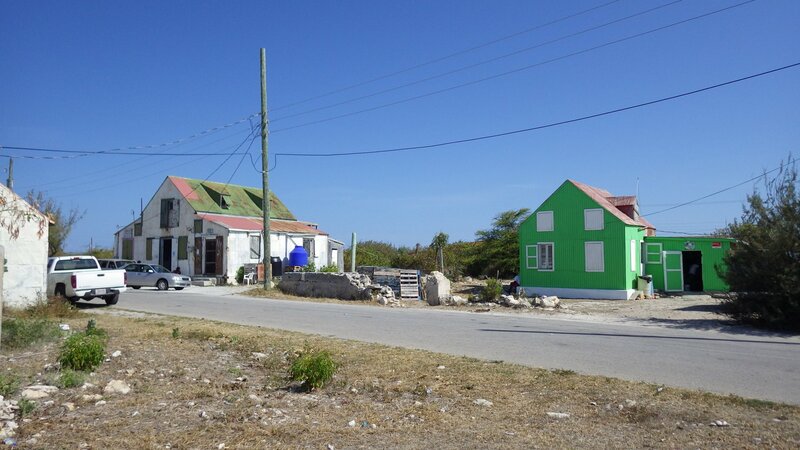 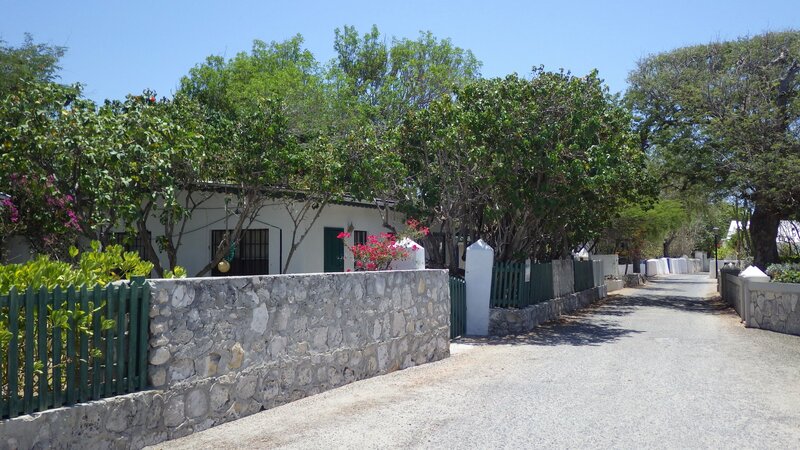 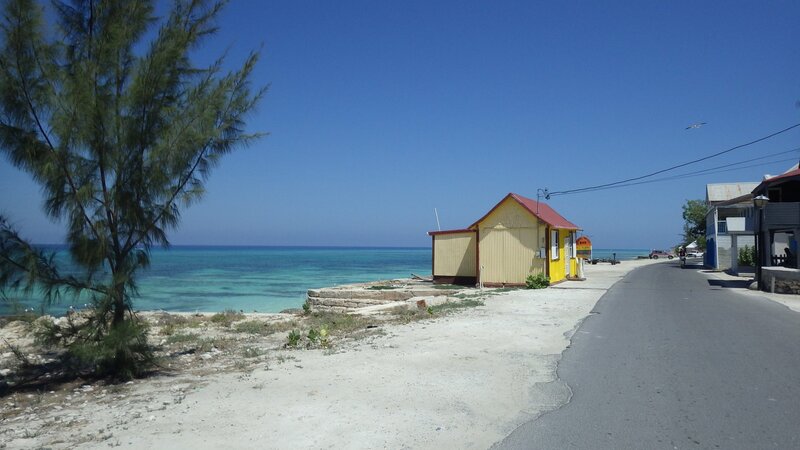 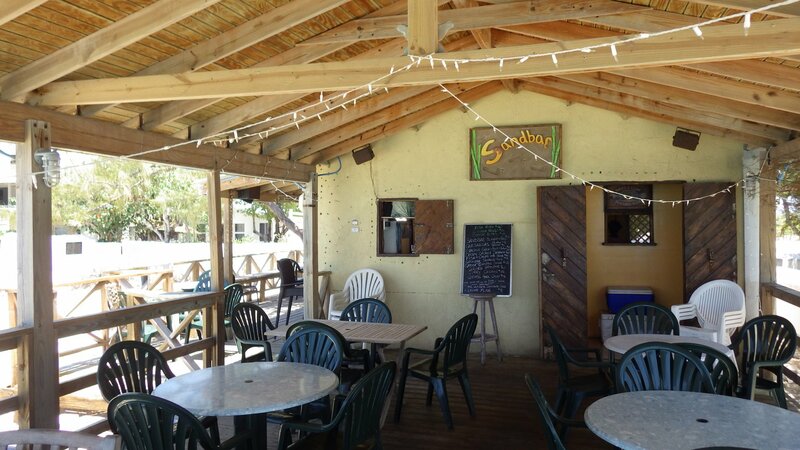 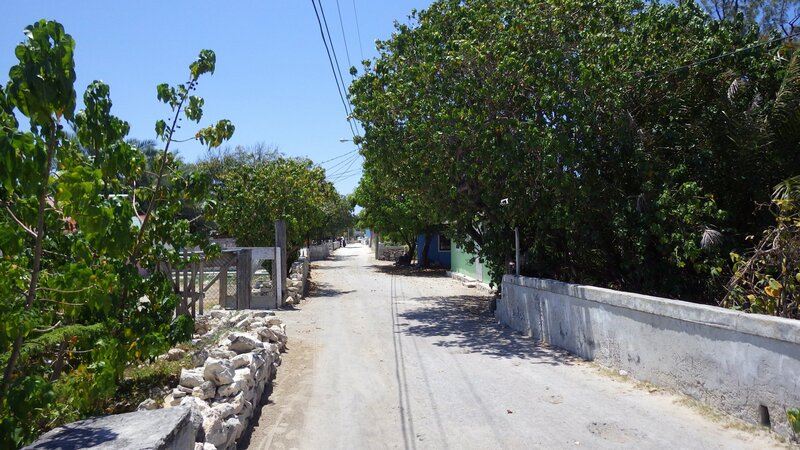 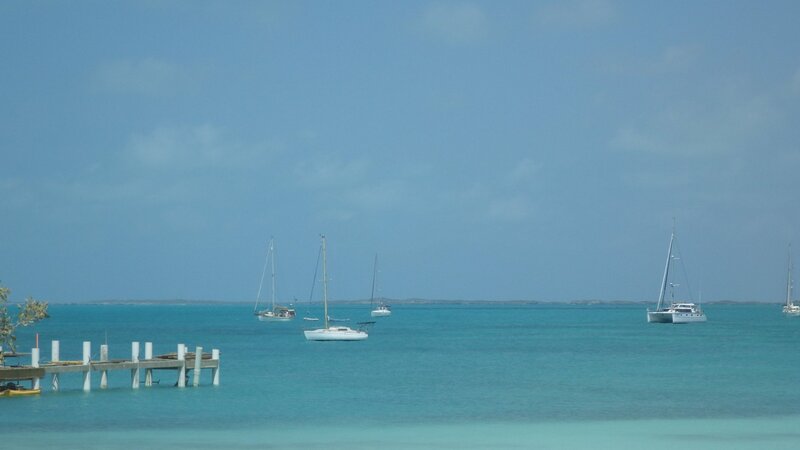 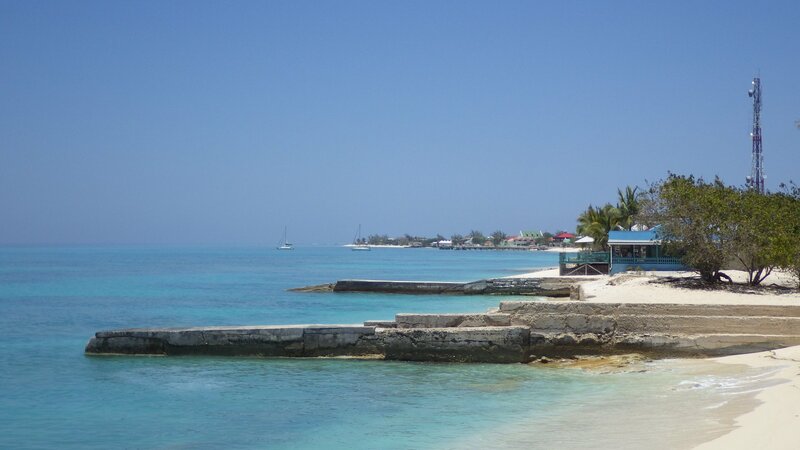 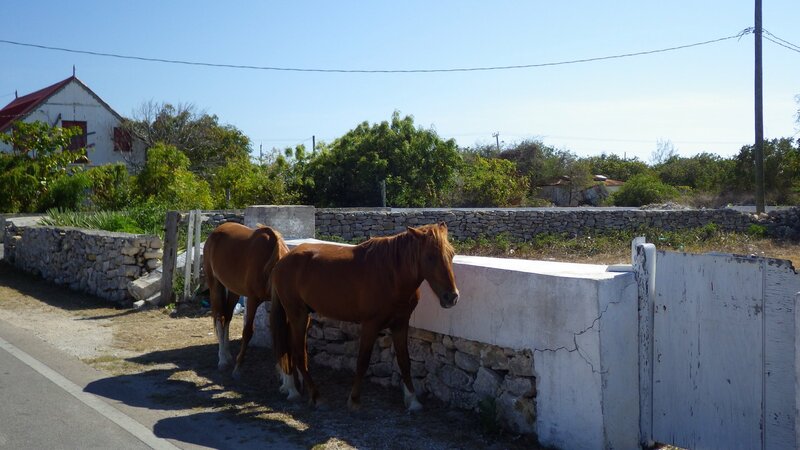 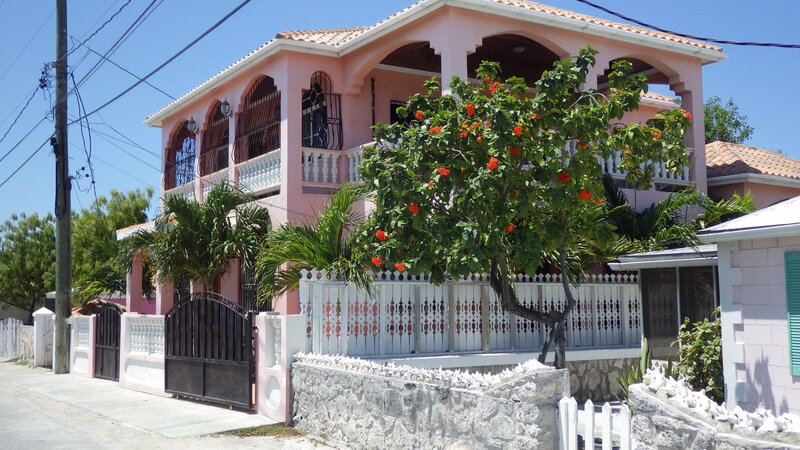 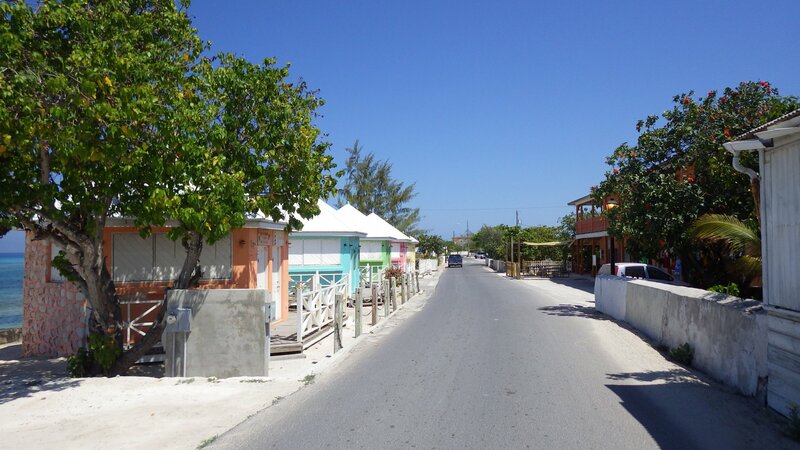 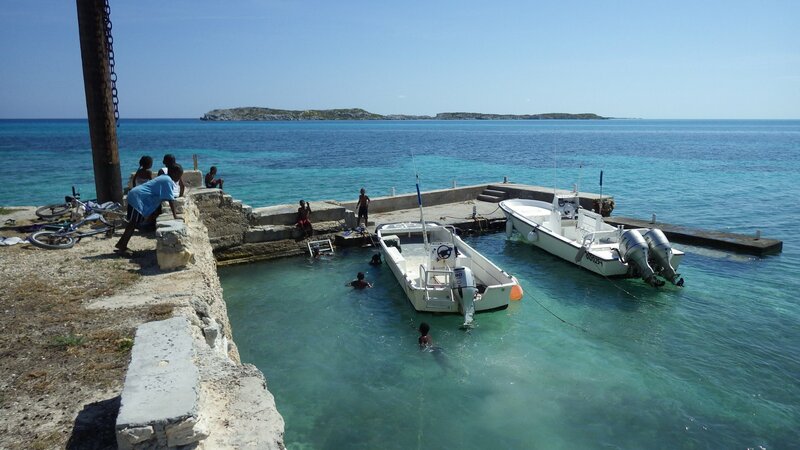 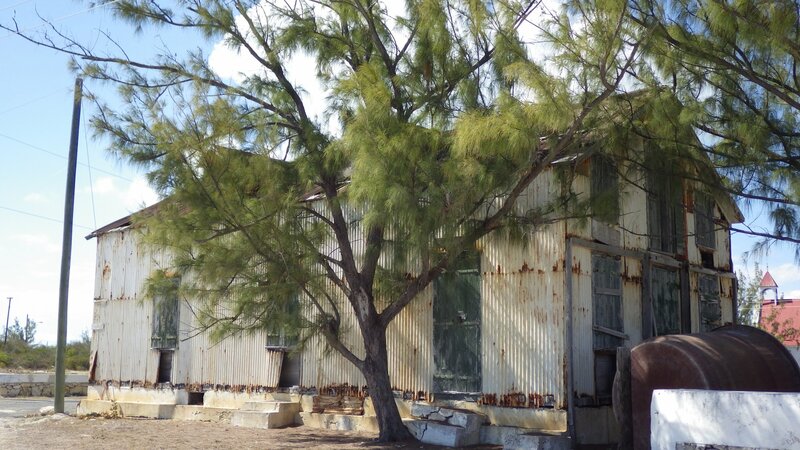 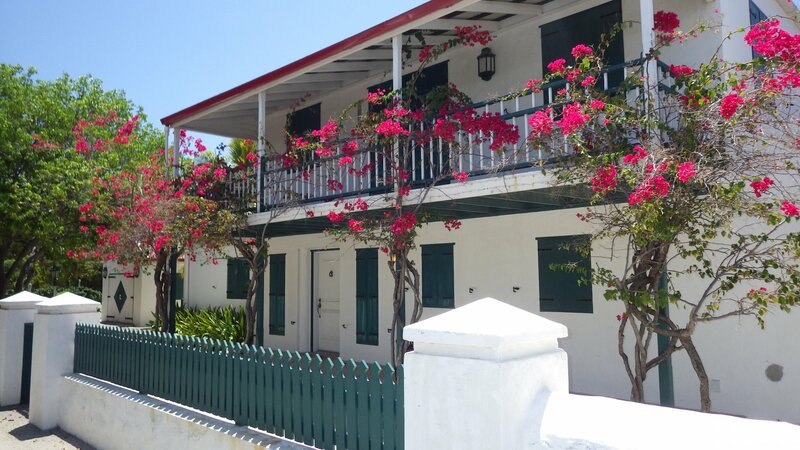 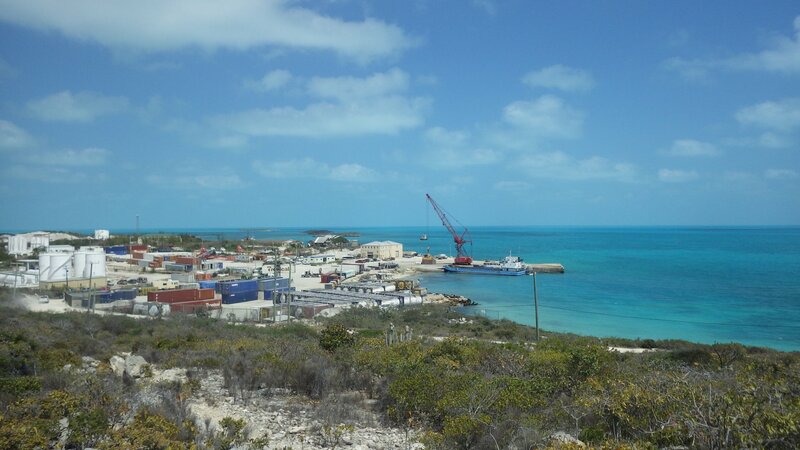 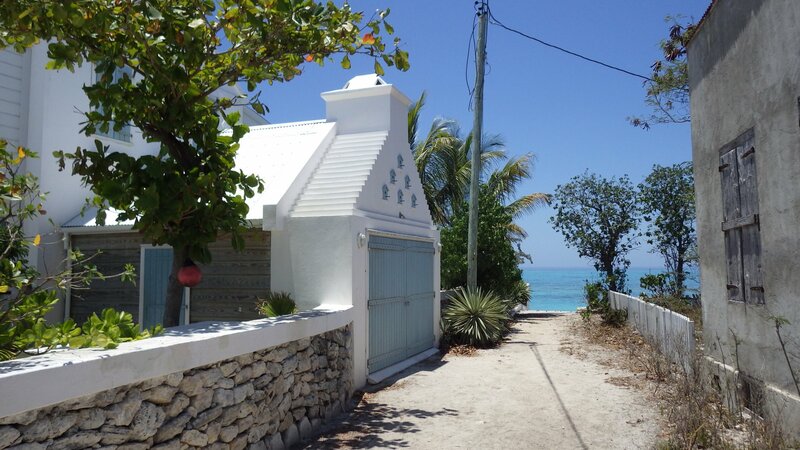 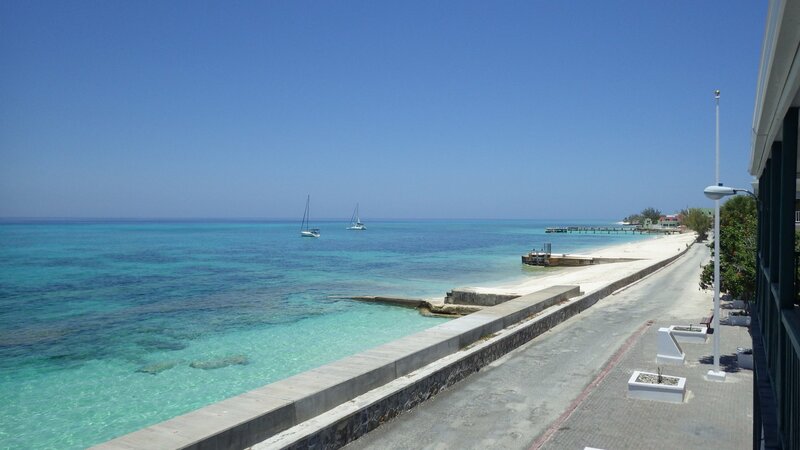 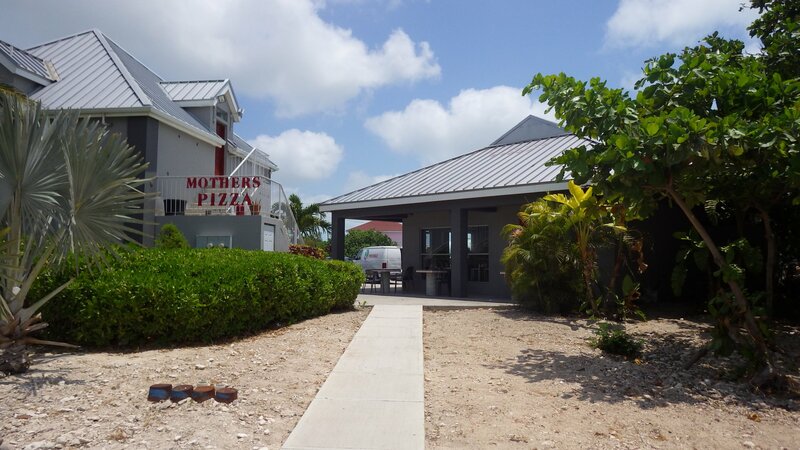 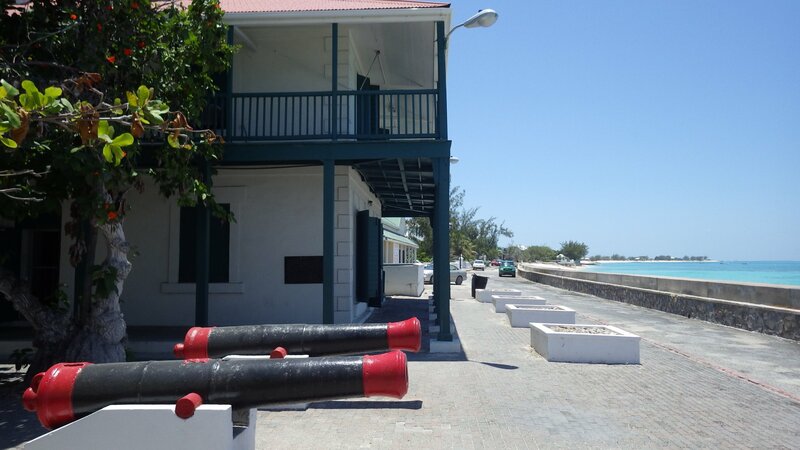 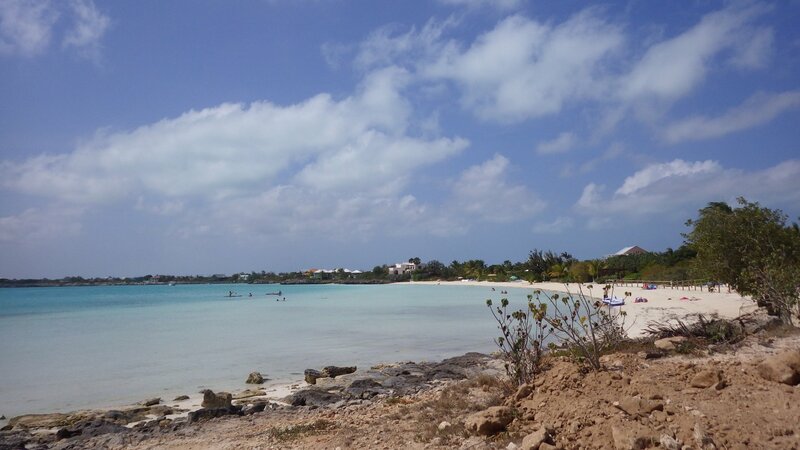 The main settlement on South Caicos Island is mostly a fisherman's town. 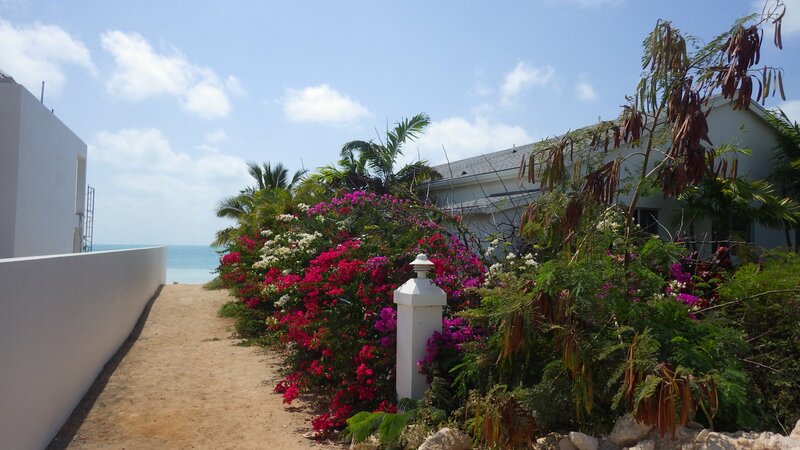 Fish plant, tourism and Marine Field Studies School keep the place busy. 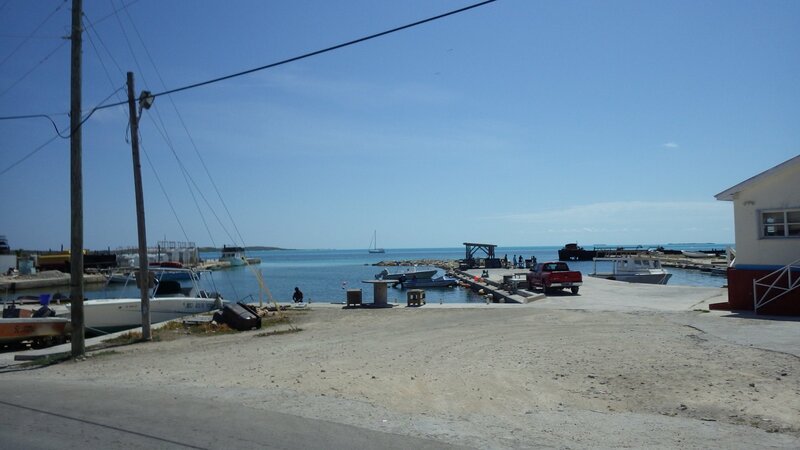 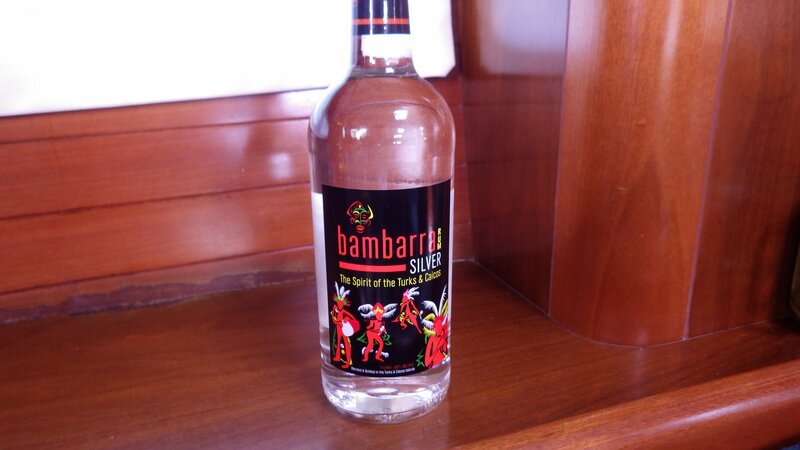 Walked around the town, met with locals, got some provisions and diesel. 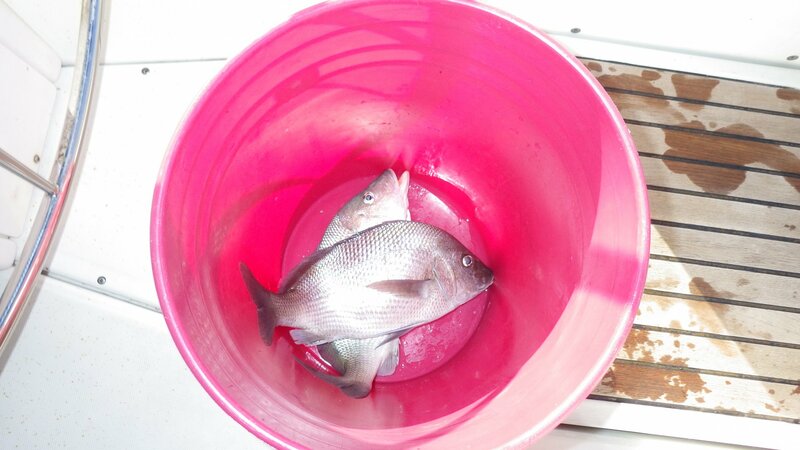 Bought fresh fish from the local fisherman who was fishing in his boat nearby. 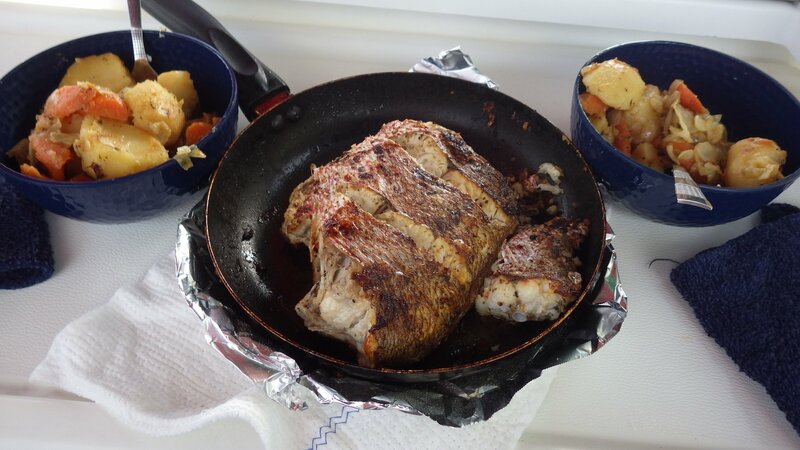 Made a nice fried fish dinner. 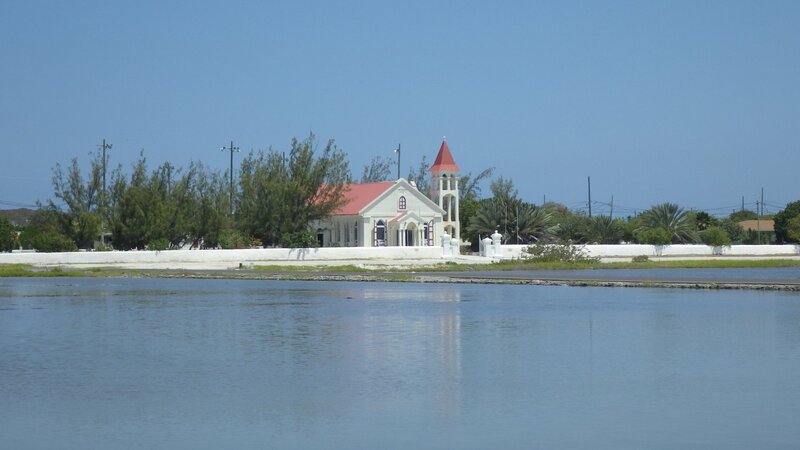 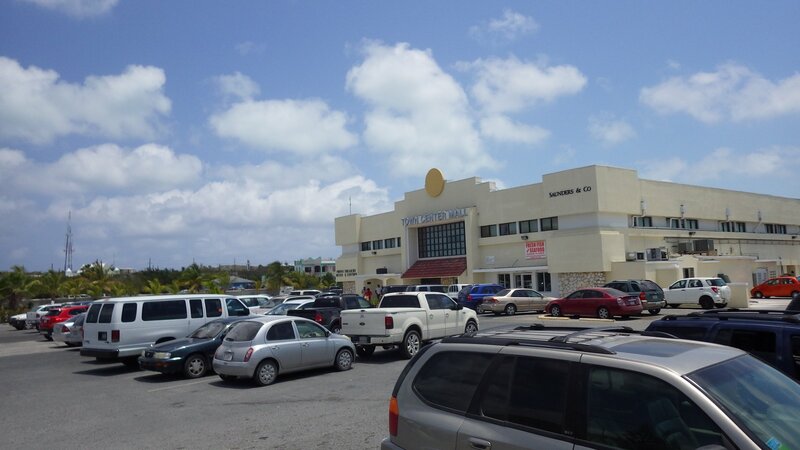 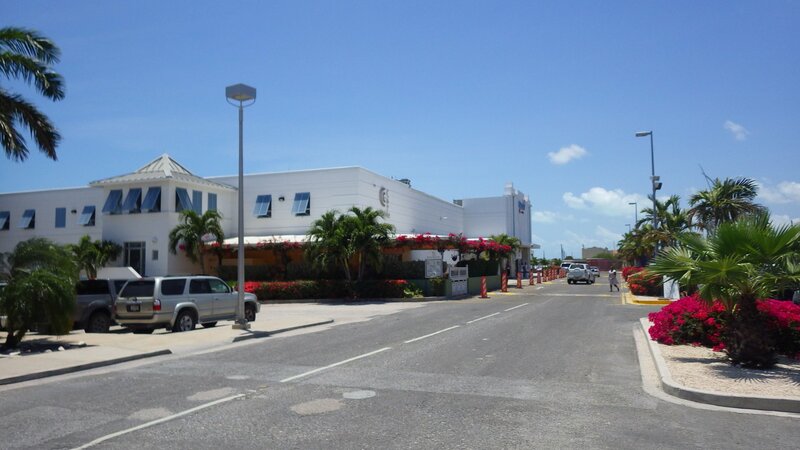 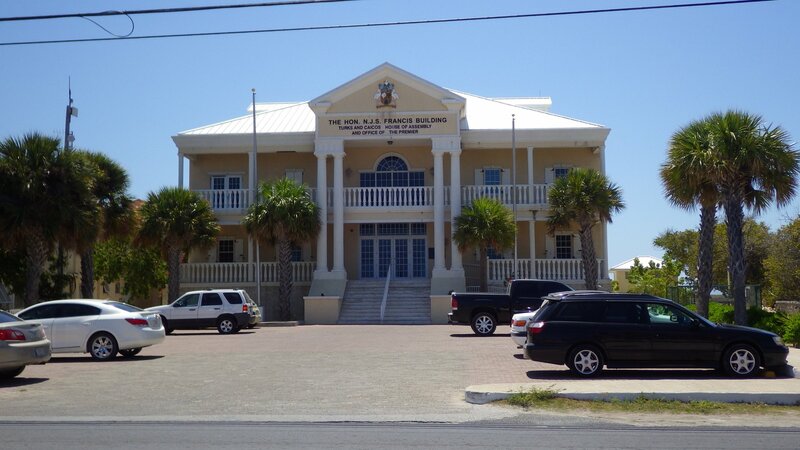 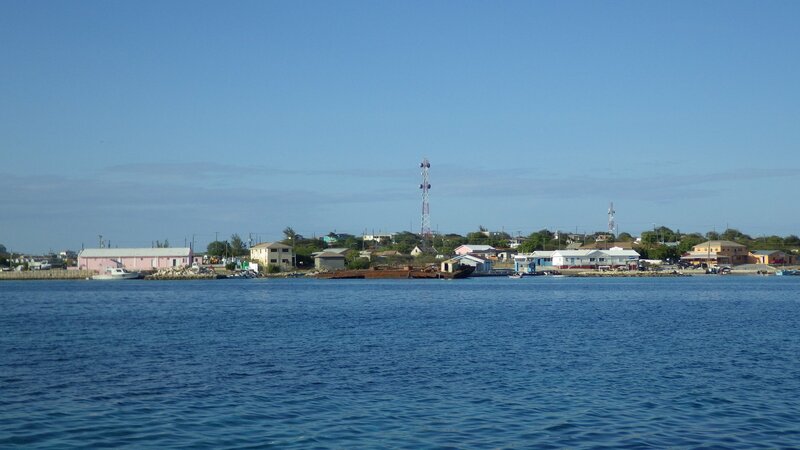 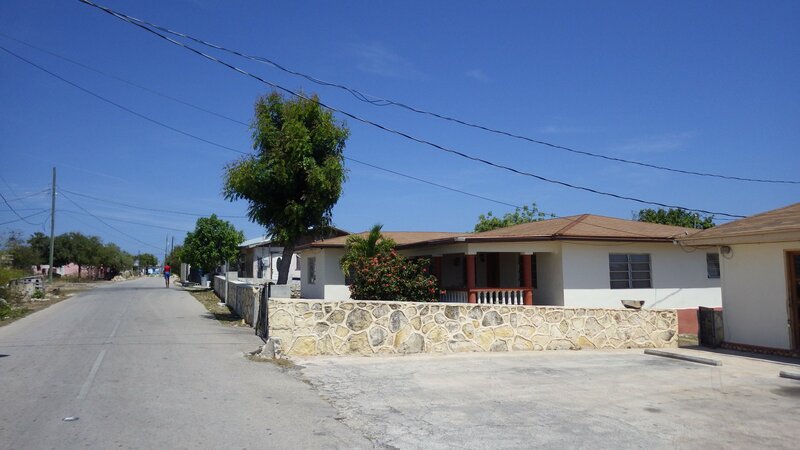 Cockburn Town is not the largest city but is the capital of Turks and Caicos. 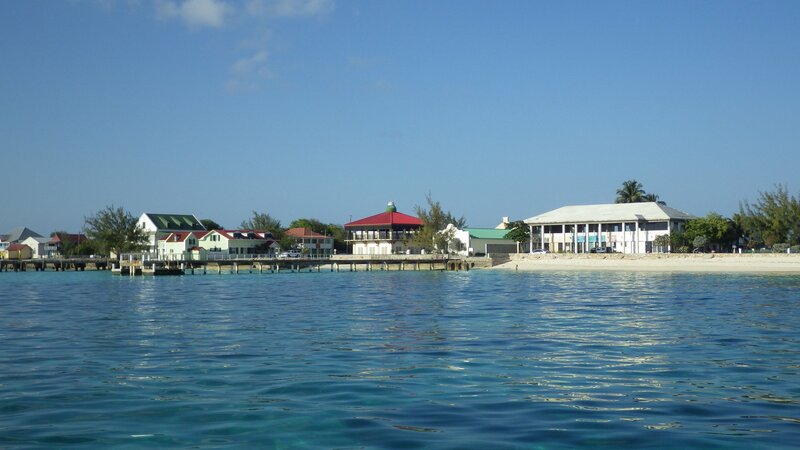 Stayed for couple days here. 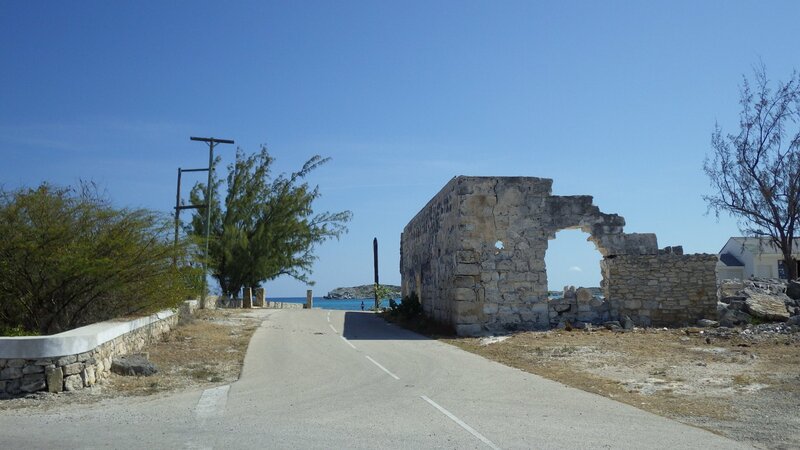 Visited some historical streets, wondered local back streets as well. 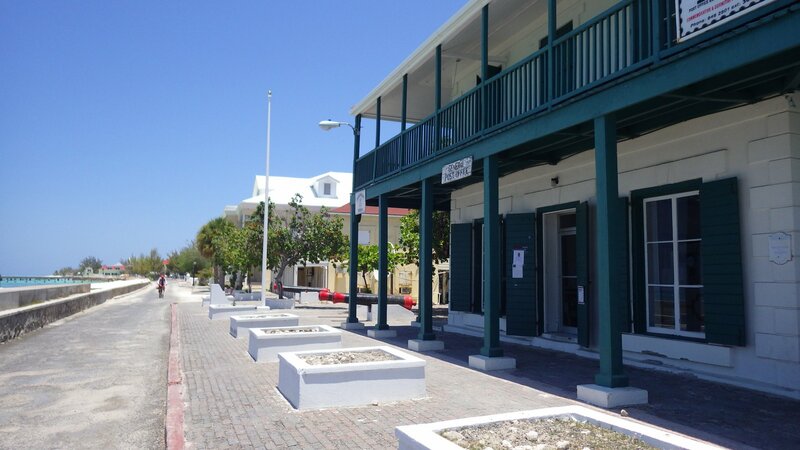 Many services (museums, shore side shops) seem to open only during cruiseships' arrivals, which wasn't the case during our stay. 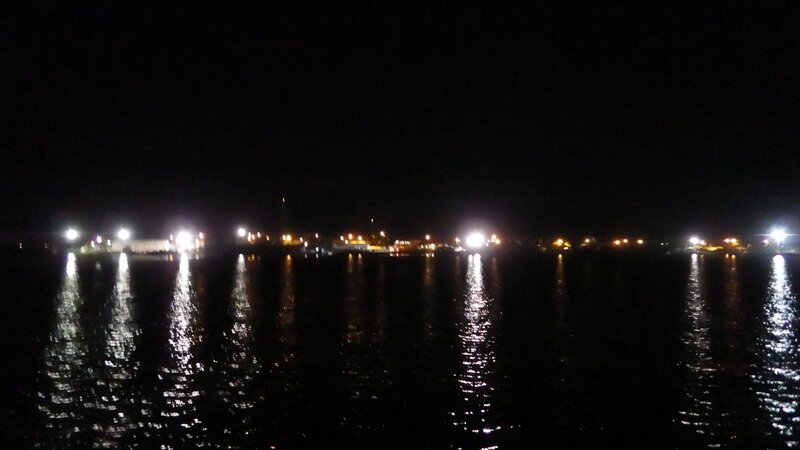 Second night moved a bit south, closer to the customs for clearing out of the country. 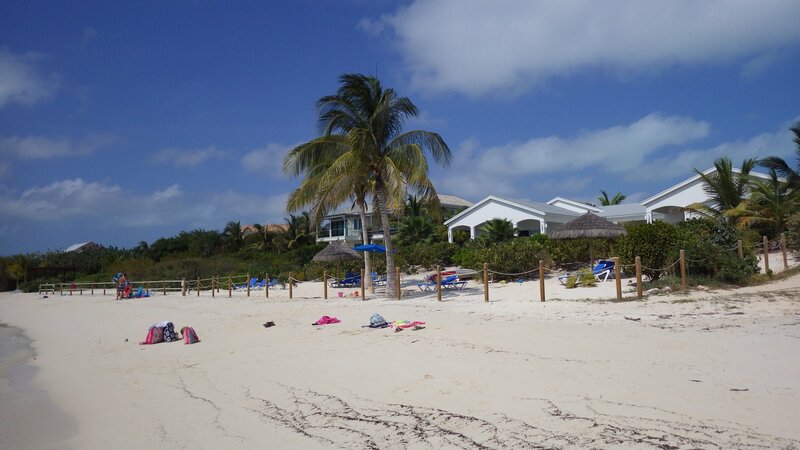 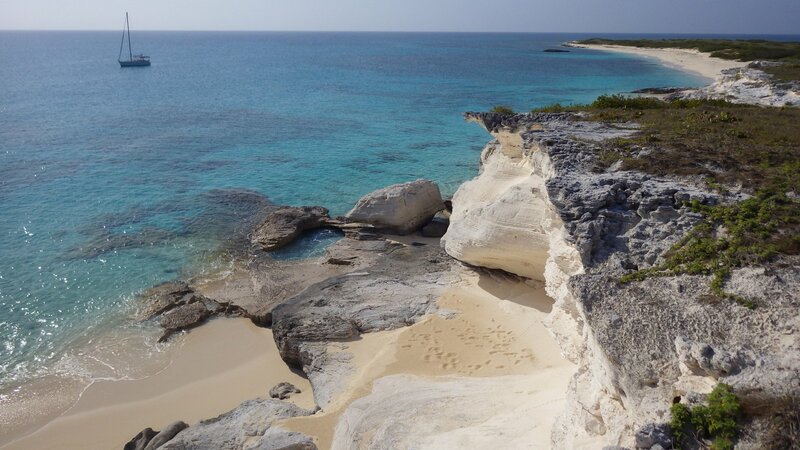 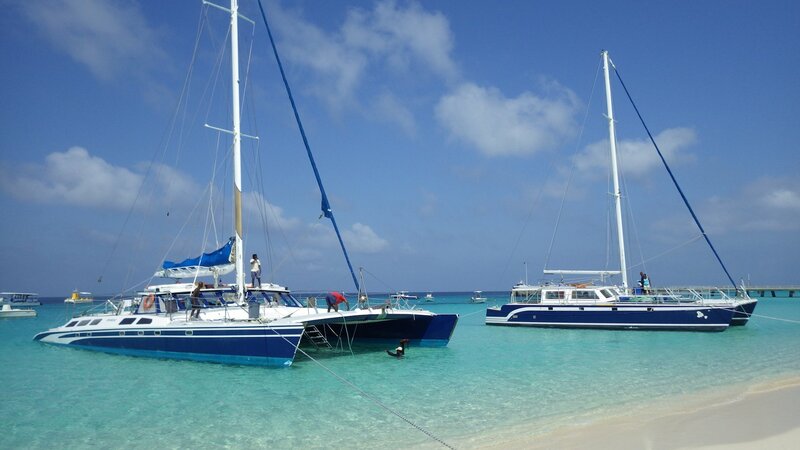 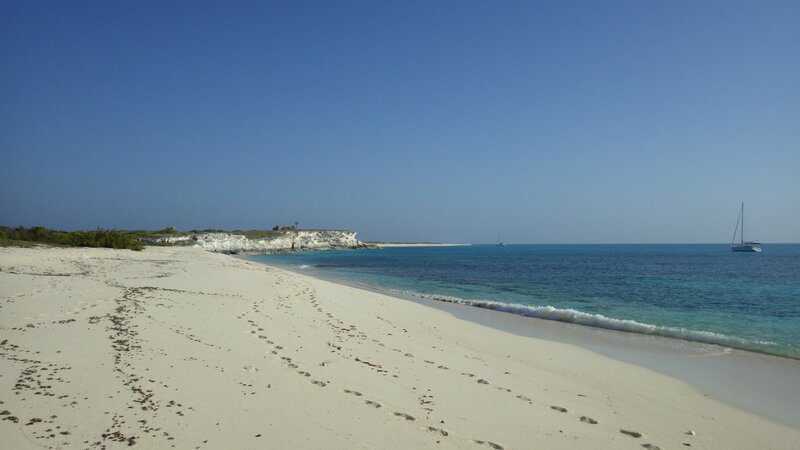 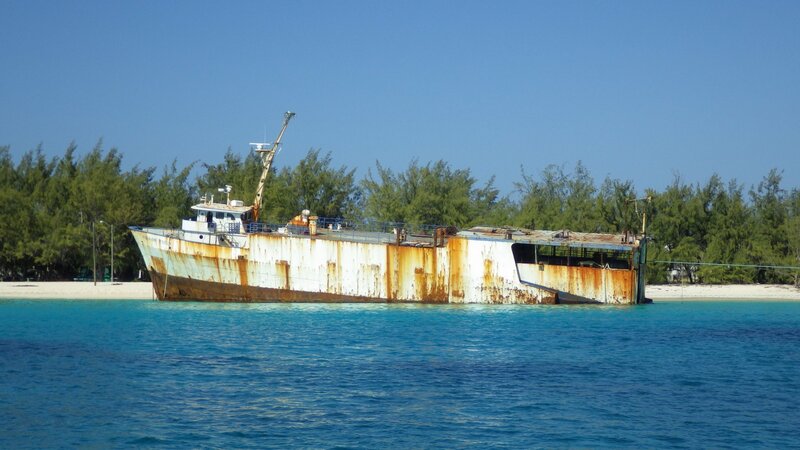 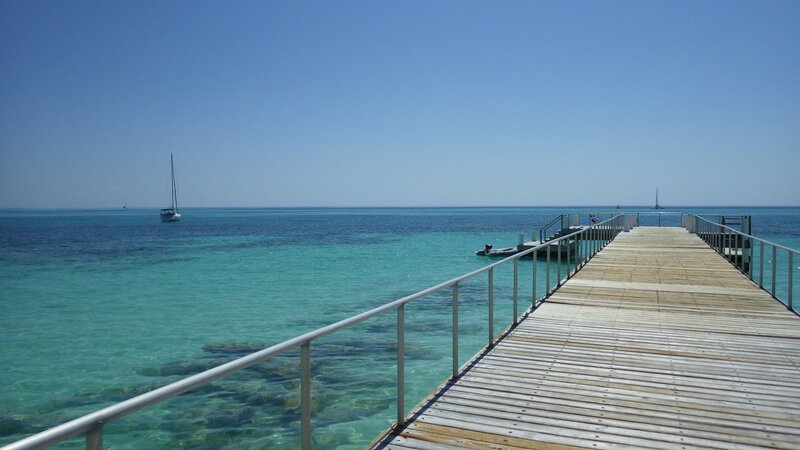 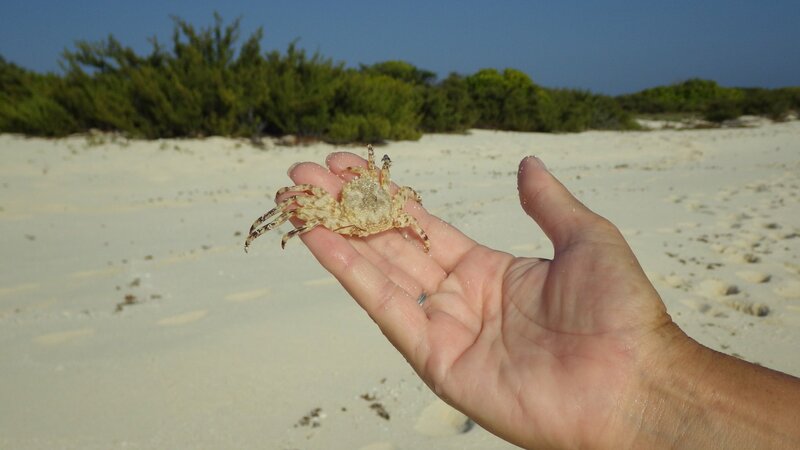 The Big Sand Cay is a convenient overnight stop at the edge of Turks and Caicos for staging a long passage to the Dominican Republic. 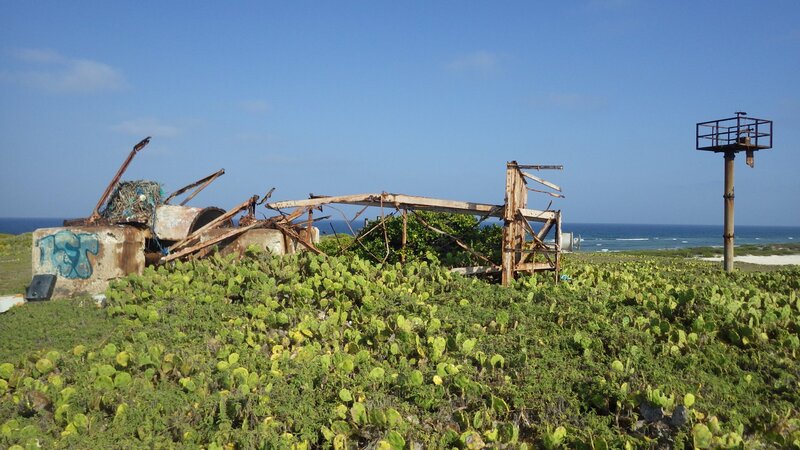 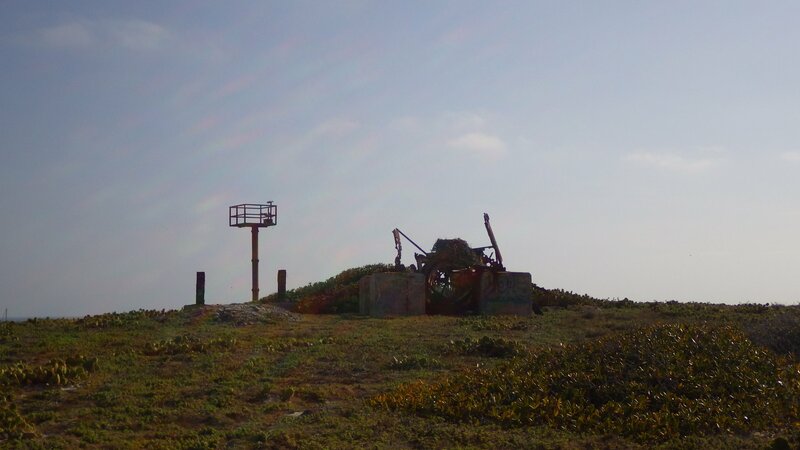 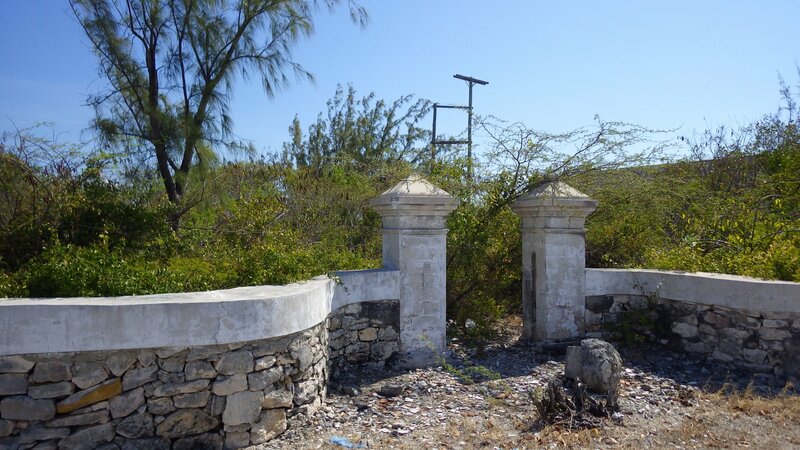 We went onshore, visited lighthouse structures destroyed by the hurricane. 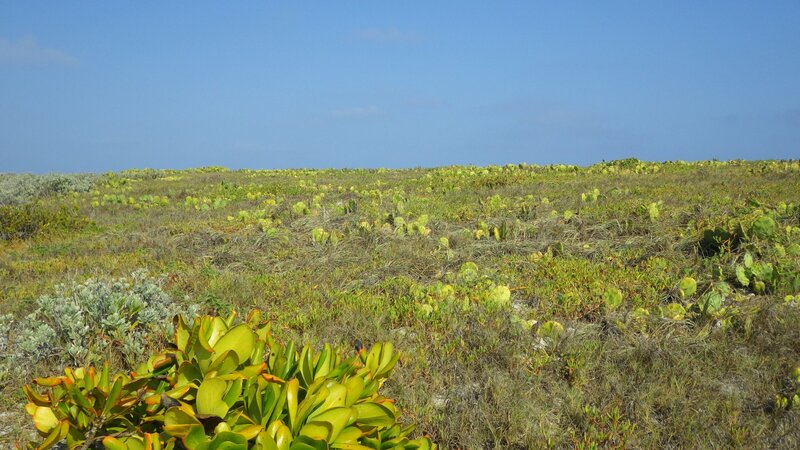 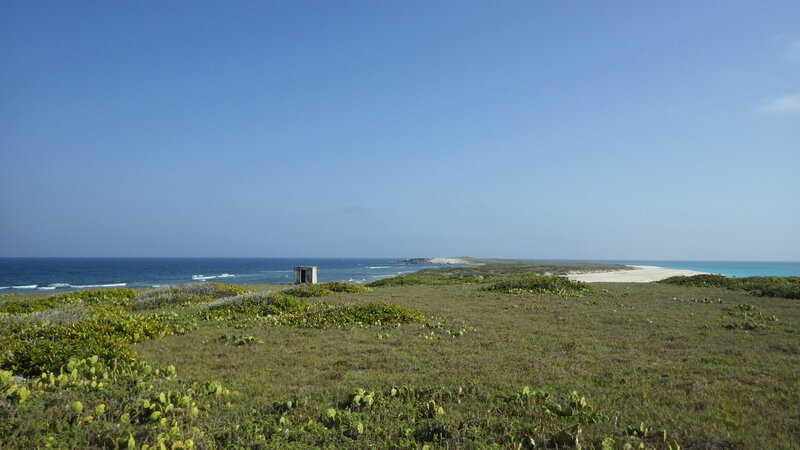 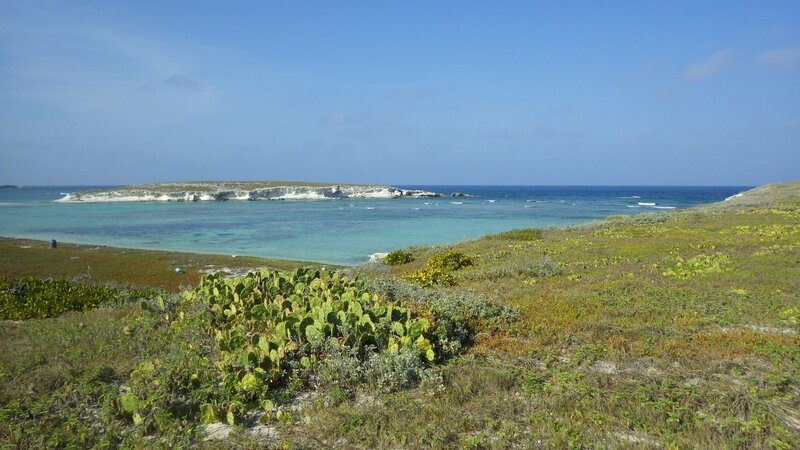 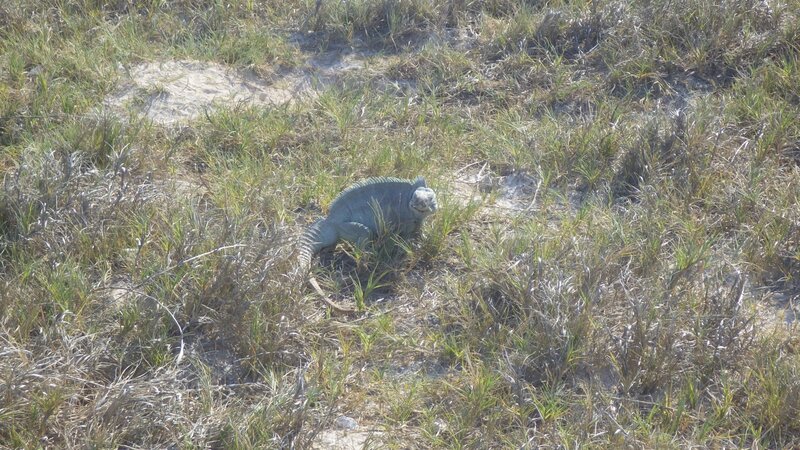 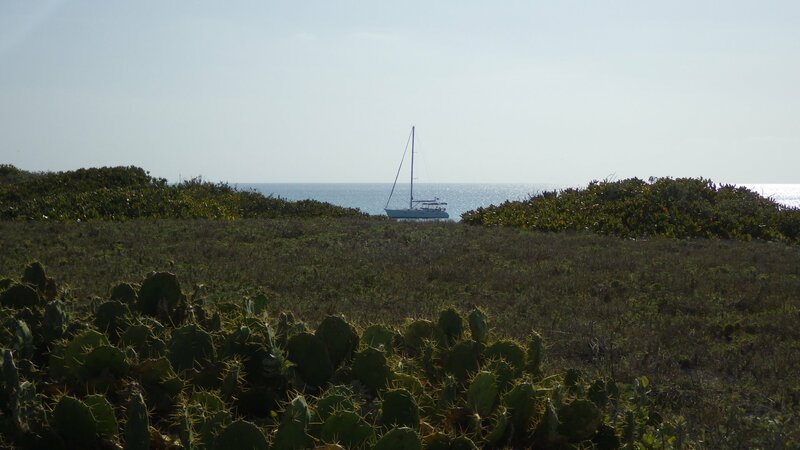 Lots of prickly grass and cactuses, some blue iguanas, and many loud seagull like birds.